Elizabeth Restaurant will open on Wednesday, September 19th. Tickets will go on sale soon. We have adopted the ticket system used by Next, Alinea, and Nomad. How it works: You will be able to create a secure account just like you would an etsy, amazon, or online shopping account. Once ticket sales are open we will notify everyone on the mailing list and those following our social media sites. You will be able to log into your account, pick a date, menu with corresponding time, and party number. We will have tickets available for parties of 2 or4. 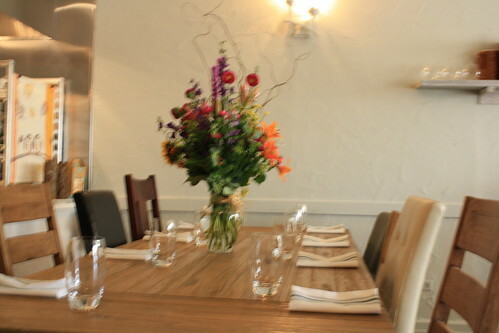 For parties of 6-8 you can call the restaurant and we will handle the ticket purchase by phone. We will also handle requests for single dinners or odd number ticket sales by phone and availability. Once tickets are purchased for menu price, tax and 20% gratuity you will receive an email confirmation and phone call within 48 hours to discuss any details. Tickets will be non-refundable but transferrable. 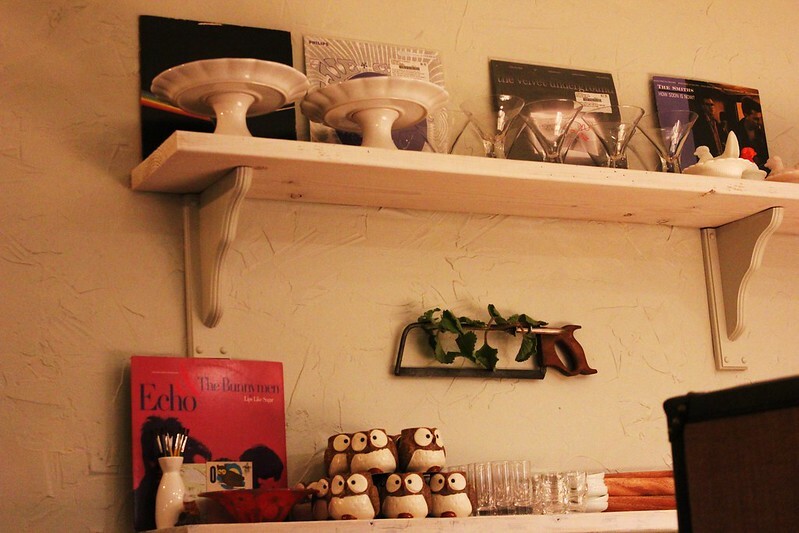 Elizabeth Restaurant strives to remain as local, organic and sustainable as possible. Elizabeth's Mission is to highlight nose to tail, root to branch, and farm to table Midwestern bounty. Elizabeth's Goal is to build community through love of food and nature. We have adopted the prepay policy so that we may be as earth conscious as possible, knowing what and how much to prepare for each night of service. This helps us keep our staff small, our space intimate, our attention to detail intact and our imaginations endless. Farm to Table. Seasonal. Local. Gastronomic. Seasonal. Local. Rare ingredients. Challenging. Woodland influenced and sourced. Local. Seasonal. I want to buy a ticket, however they require parties of 2 or 4 and I do not have anyone to bring along. Does anyone need a second or 4th for their party? I would be able to go Thursday or Friday. jwhitaker wrote: I want to buy a ticket, however they require parties of 2 or 4 and I do not have anyone to bring along. Pretty sure that I read that they only do the online ticketing for parties of 2 or 4 but for all others whether larger or smaller, you can call or email. I think they specifically mentioned accommodating solos. Not that you still shouldn't find some folks to pair up with--sounds like fun! Awesome. She will accommodate vegetarians! Chef Regan comes tableside and explains each course. As Elizabeth is brand new there likely will be a few kinks to work out at first, but there is no doubt it will be amazing food and a fun experience from day one. I really think that Elizabeth will take off fast and has strong potential to become among the upper echelon of Chicago restaurants. Based on the phenomenal meal I had at One Sister and my experience tonight during Friend's & Family I highly recommend Elizabeth! the pictures show very intriguing and attractively plated food. 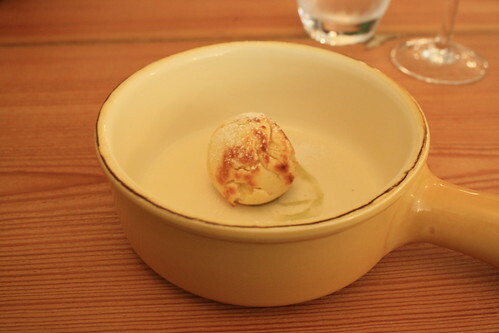 did you actually feel like you'd eaten a full meal when you were finished, as the courses all seem rather small. 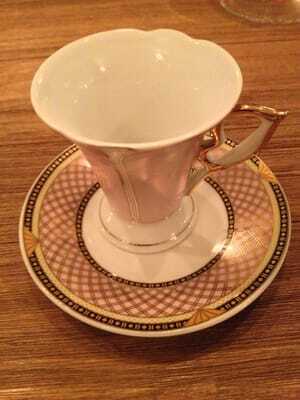 justjoan wrote: the pictures show very intriguing and attractively plated food. 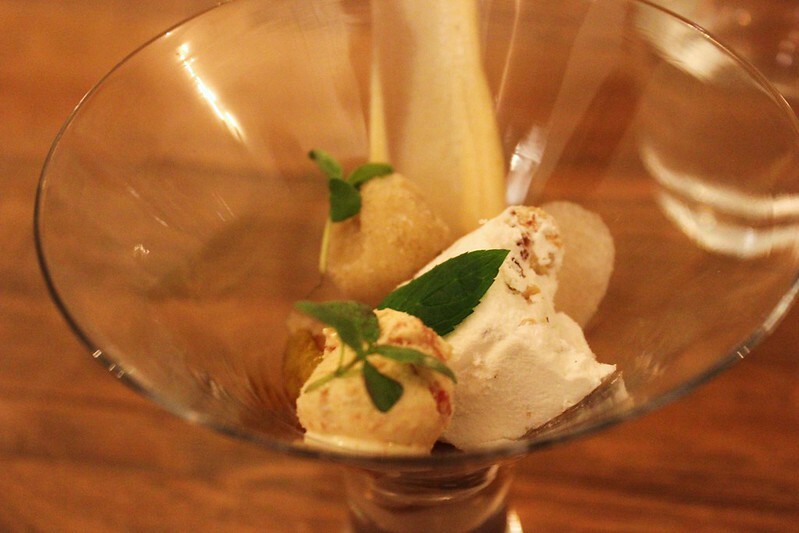 did you actually feel like you'd eaten a full meal when you were finished, as the courses all seem rather small. 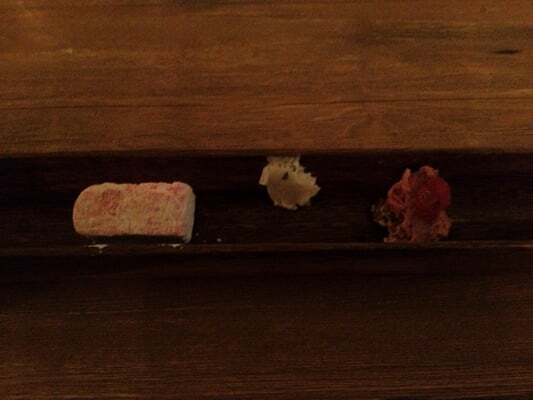 There are three tasting menus, each varying in length. The menu I had last night was the shortest of the three. If you have a large appetite it likely will not be completely filling, but adds up to more of a light meal. Quality and having a fun, interesting experience is definitely emphasized over quantity. The medium length menu (which I will be having later this month) will likely be about the equivalent of a full meal and the long menu (20 to 25 courses) should be rather filling. I think that the addition of a bread basket/bread service might be helpful to make the short menu be more filling (and might help with the medium menu too for those with large appetites). We have worked out our portions and each menu, as of our opening date, 9/21/2012, should be completely filling to anyone with any size appetite. Kind of last minute, but if anyone wants to join a group of foodies for the Owl menu at 6:30 tomorrow, email me at mgmcewen@gmail. We have one spot left. 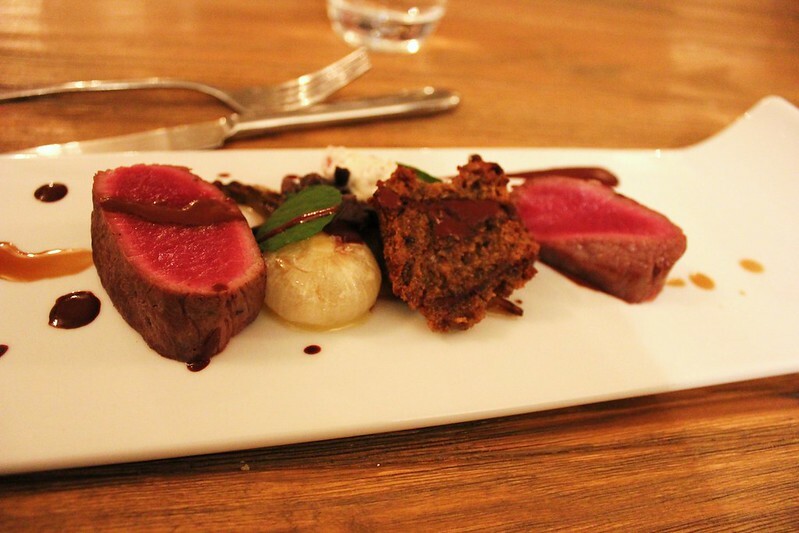 I had such a wonderful meal last night at Elizabeth; this time I had the medium length Deer menu (which consisted of 16 courses). Some of the courses reminded me of my dinner I had at One Sister and there were several courses unlike anything i had had before. One striking difference (for the better) was that some of the courses were much more substantial and heartier than my meal at One Sister and my Owl menu meal during Friend's and Family. About half the courses are 1-2 bites, but half the courses were a nice amount of food and this was definitely a filling meal. 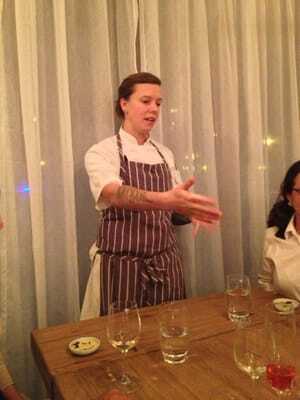 Chef Regan mentioned that she has already made some revisions to the Owl menu and that it is heartier as well. At my table were three friends I actually had met about a year ago via Facebook on Next Restaurant's Facebook Page (we all were helping one another score season tickets and ended up forming friendships). Elizabeth has communal tables for eight, and while I did not know the other four people, they all were rather friendly. In some restaurants communal tables can be a negative, but at Elizabeth they really work and actually enhance the experience and the type of ambiance Chef Regan is striving to create. About the only knock on the ambiance is that when all three tables are filled it can be a tad noisy; but certainly is not unbearably loud. 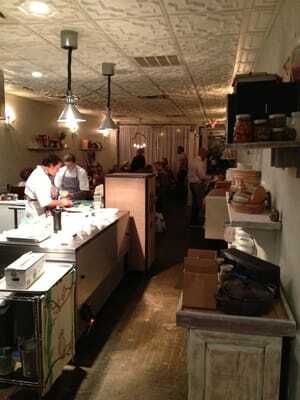 Service was quite good for a brand new restaurant; everybody I encountered was extremely friendly. 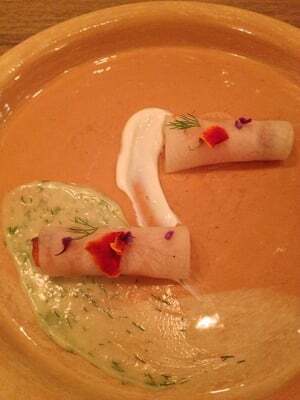 There were some gaps between courses at times, but that is to be expected for a new restaurant (especially factoring in the complexity and shear number of courses being served); since Elizabeth has such a fun vibe, a leisurely meal is quite enjoyable. The 16 courses took about three hours and forty minutes, but the food was so amazing and the experience so fun that time flew by and it did not seem like an overly lengthy meal by any means. I imagine that within a few months the pace may pick up, but I would have no complaints if this ended up being the norm; I was sorry to see my meal come to an end. 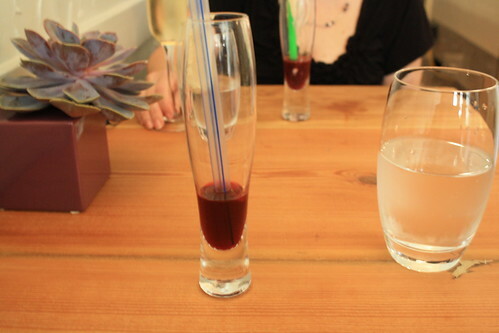 You have the choice of complimentary still or sparkling water; glasses were nearly always kept filled, napkins were folded when guests went to the washroom, and all the staff seemed passionate and happy to be there. 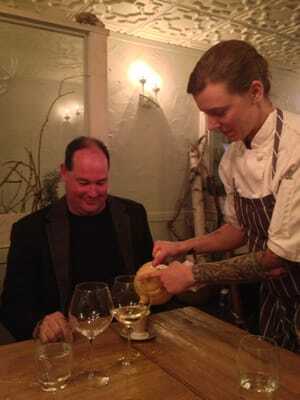 Elizabeth has Scott Noorman (formerly of Trio and Graham Elliot) running the wine program. He was very attentive and helpful in discussing the options. There is a wine pairing available; I believe it ended up being $85 for the Deer menu and consisted of eight different wines; the pours were rather generous for a tasting menu - probably a little over a half a glass at a time on average based on my observations; I did not partake in this myself, but the person next to me did the pairings. There is also a nice selection of cocktails (for now there is not a cocktail list, but they will describe the options to you - some of the cocktails are made tableside) as well as a very nice assortment of wines by the glass and by the bottle. The wines are very reasonably priced; most of the wines by the glass run $10 to $14 and many of the bottles are in the $40 to $60 range. I tried three different wines during the course of the evening (Scott helped recommend which ones would be best based on my preferences and the upcoming courses) and all were quite good. The food was outstanding. Some courses stood out more than others, but not a single dud in the 16 courses and several were phenomenal. 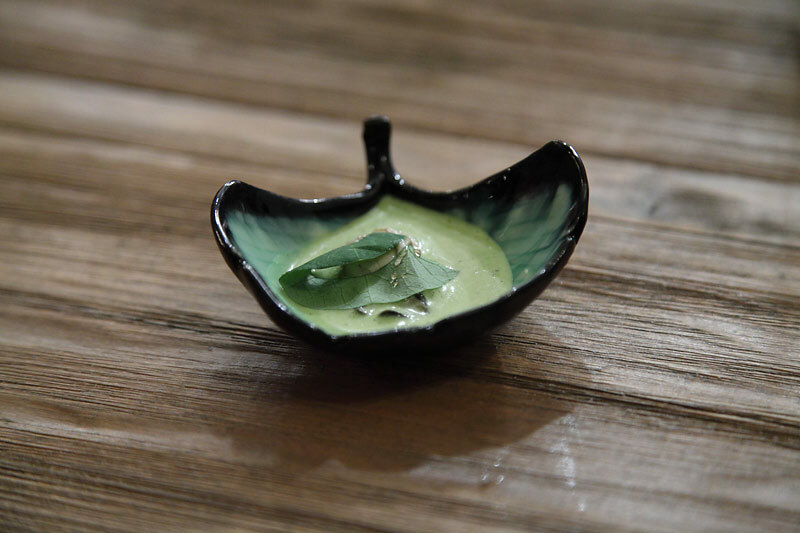 In addition to tasting amazing, much of the presentations were beautiful and there were all sorts of exotic ingredients as well as interesting (but successful) flavor combinations and concepts. One of the draw of Elizabeth is how personal the dishes are; Chef Regan grows much of the food, forages for some, does a little hunting and fishing, cures some of the meat in house, makes her own cheese and ice cream, and does lots of pickling. She is so incredibly talented for this being her first restaurant; this is already a top notch dining experience but she is only scratching the surface of her potential. Adding to the experience, Chef Regan comes tableside for the majority of the courses explaining the dish and answering any questions. 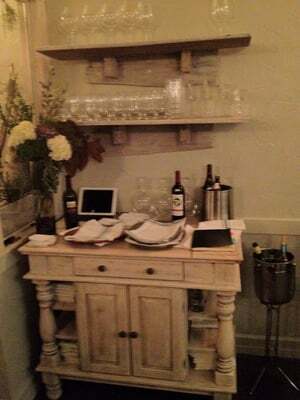 There was no coffee service last night (something I enjoyed at One Sister where she served some outstanding coffee), but it does appear this is coming soon based on some pictures I noticed Chef Regan post on Twitter and Facebook and I spied some French presses in the back. 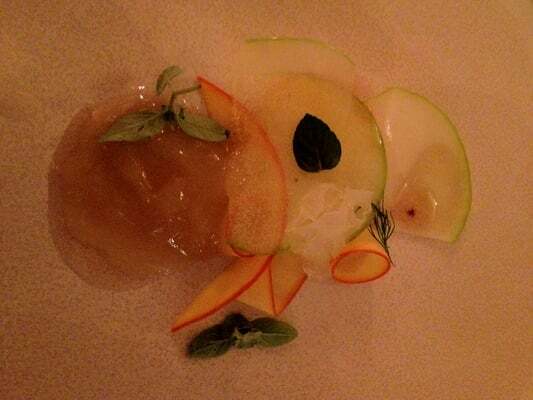 In my opinion Elizabeth is already one of Chicago's best and most interesting dining experiences. It is brand new, so if you dine here during the next few months do not expect perfection as I imagine there are still some kinks to work out (though just about everything was pretty smooth last night). One does have to be a bit of adventurous eater as there is a fair amount of exotic ingredients, game meat, and some organ meat on the menu, but Chef Regan is one of those chefs that is able to make foods that normally do not appeal to me taste so good that I lick the plate clean. I had such a fun dinner last night and plan to come back towards the end of the year for the Diamond menu (the longest of her three tasting menus). Centerpiece; part of the centerpiece became involved in one the courses. 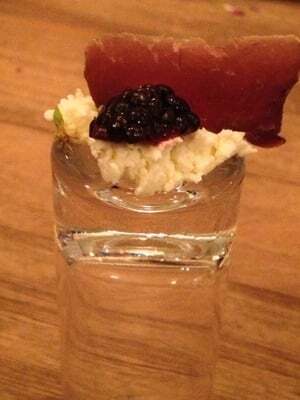 Huckleberry Pie Amuse Bouche - tasted just like a shot of huckleberry pie and was a great start to the meal. 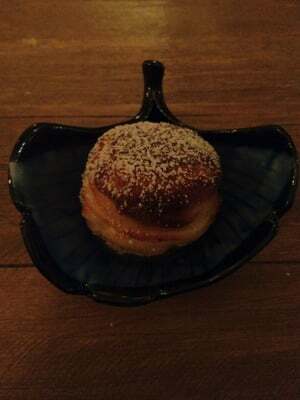 Round Pancake with goat cheese filling. Queen Anne's Lace & Carrots (some were from Chef Regan's garden). Flowers, Eggs & Twigs with Shaved Black Truffle - The "twigs" on the centerpiece were edible (and tasted amazing) and you dipped them into this truffled buttery, egg sauce. So rich, flavorful and delicious. 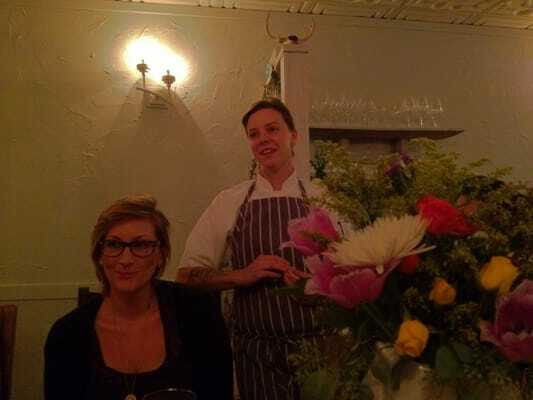 Chef Regan presenting a course tableside; she came tableside for about 12 of the 16 courses. Chantrelle Pine and Acorns. The mushrooms were foraged. 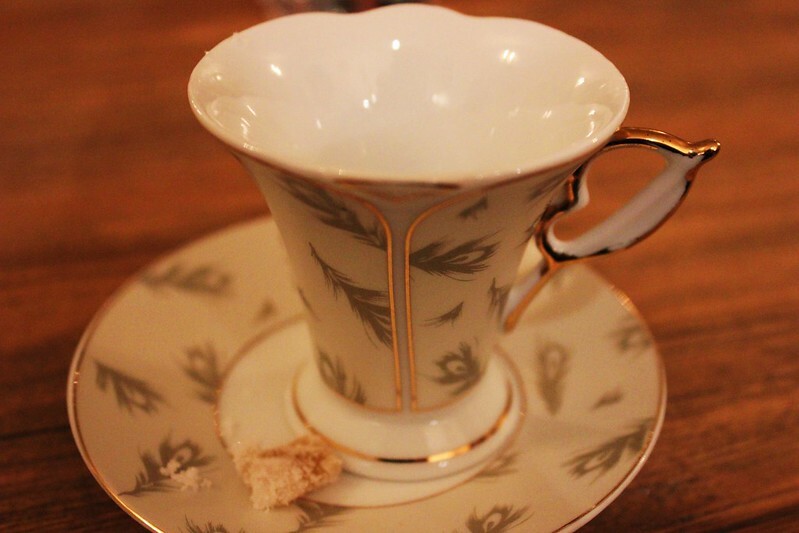 Teacup for her signature homemade Alice in Wonderland theme tea; the course is titled One Pill Makes you Larger and featured a mushroom tea with coco nibs. I could have consumed an entire pot of this tea! 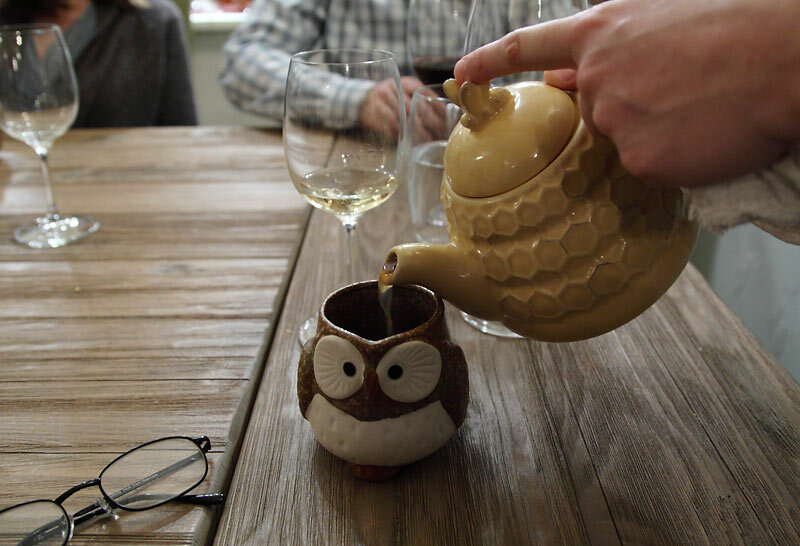 Chef Regan delivers a radio to the table and plays music from Alice and Wonderland as you drink the tea. 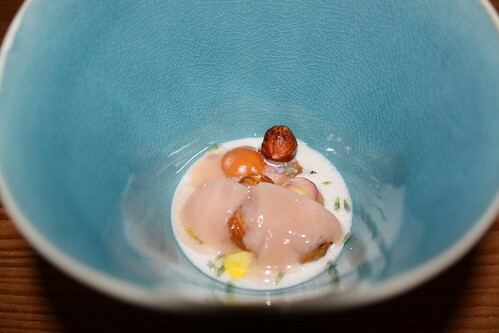 Crab Apples, Hazelnuts & Frog Legs. 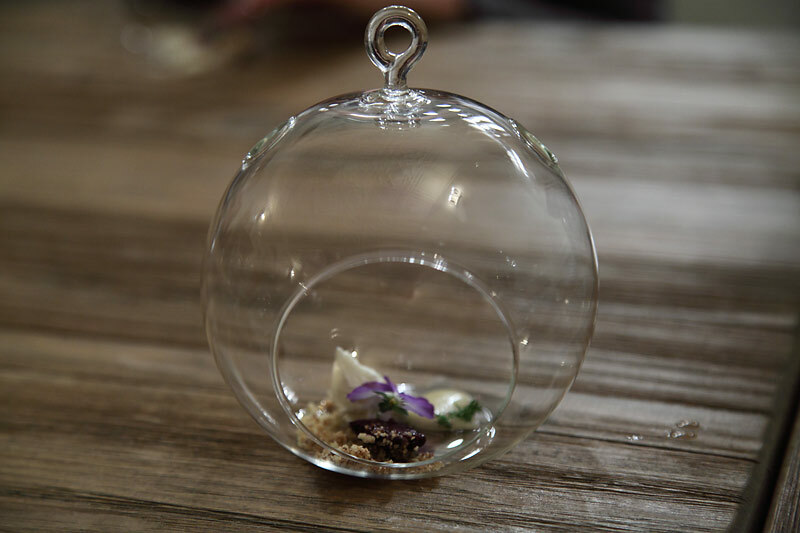 Woodland Terrarium with edible soil; some will remember this from One Sister where she had the serving piece hanging in her apartment like ornaments. Savory Cannoli filled with salmon, one with a dill sauce and one with a sour cream sauce. Deer Bresaola; kind of like deer beef jerky served atop homemade ricotta cheese and a blackberry. Wild Rice Crispy Treat with little bits of bear meat; interesting combination but ridiculously tasty - I would have loved a whole plate filled with this it was so good. 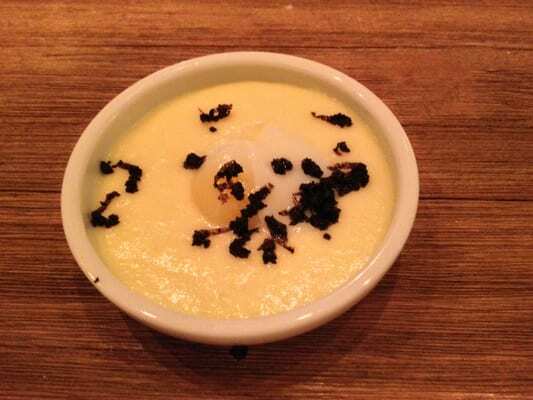 Duck Egg Czernina - the heart of the menu had a few homeruns in a row. 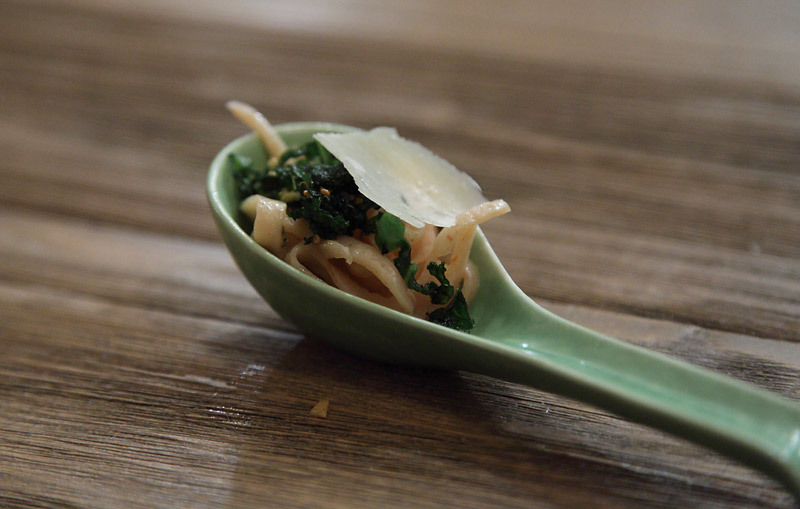 This dish was wildly popular at the table and was my second favorite dish of the night. The duck was cooked perfectly and the duck egg was quite possibly the tastiest egg I have ever consumed. 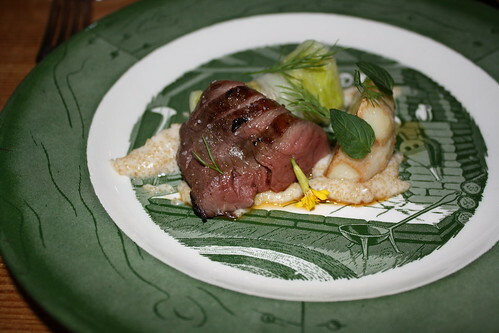 Deer Tenderloin, Celery Root and Cabbage. 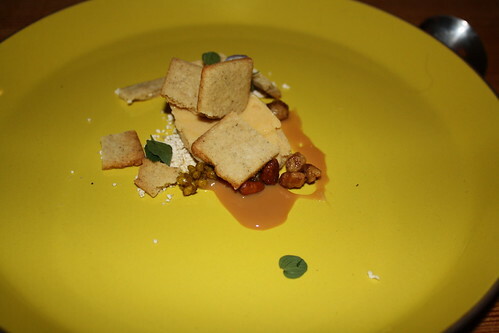 This was another extremely popular dish at our table and for me was the best of the 16 courses. The deer tenderloin was cooked perfectly and did not have any gamey taste, but was divine. The cabbage had homemade deer sausage inside that also was exquisite. 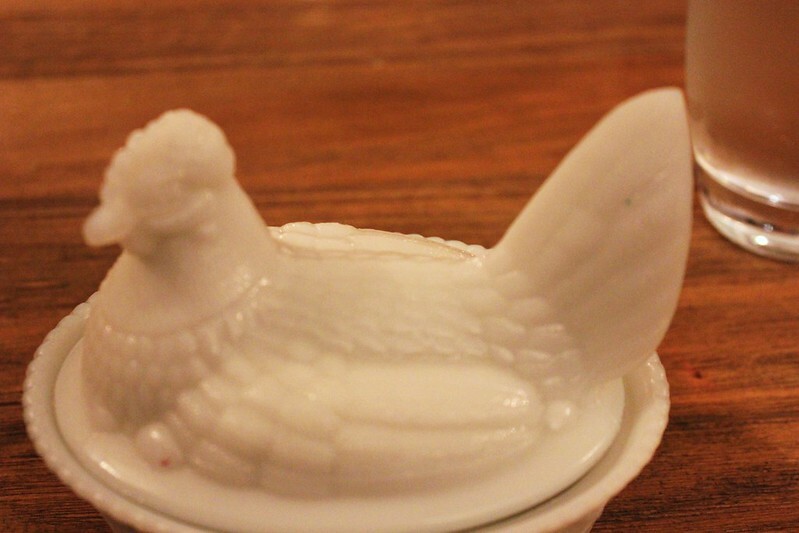 Cool serving piece as well. This dish I would not mind seeing stay on the menu year round! I found myself craving this all day. 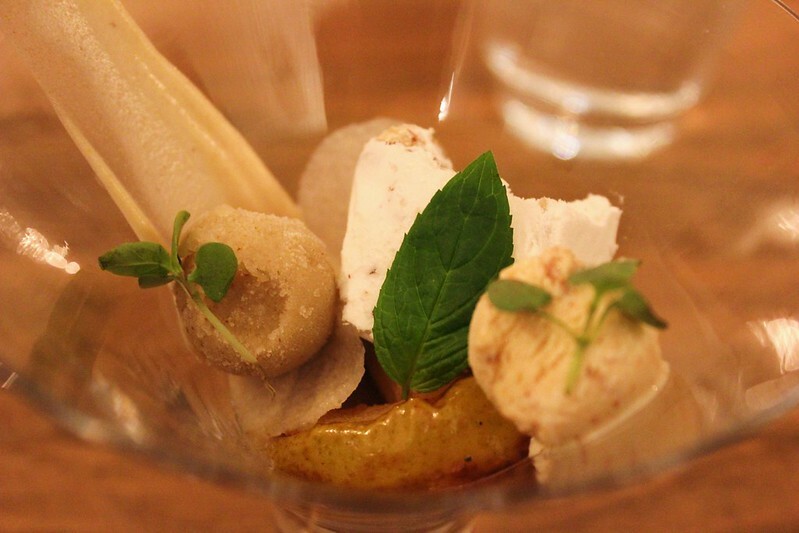 Forest Float palate cleanser with homemade ice cream (sassafras if I recall correctly). Very tasty and nice transition into dessert. 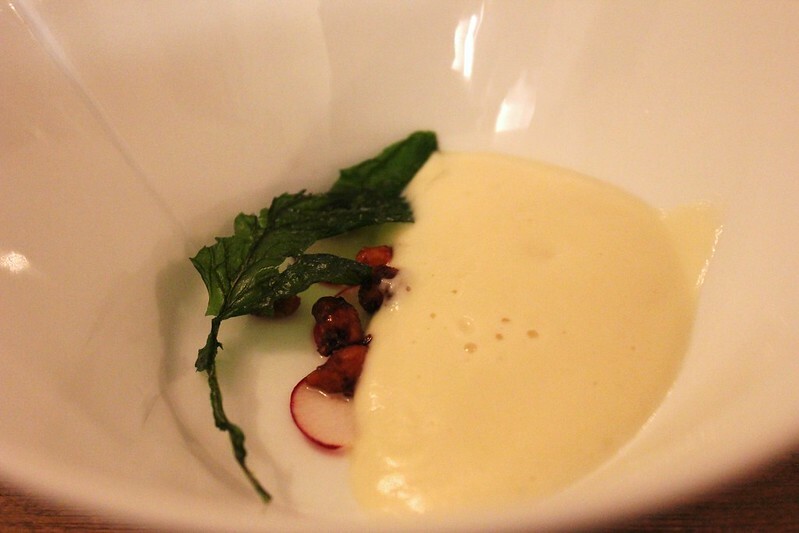 Black Walnuts and Sorghum with the most delicious, creamy caramel sauce I have ever consumed. An outstanding dessert. Wine Director Scott Noorman and the portable cocktail cart. I bought a ticket for 2 for the Owl menu on Wednesday, October 31st, but now I have an empty seat to fill. If there are any solo diners interested in joining me, please send me a message. I was invited to Elizabeth for one of the Friends and Family openings for the Deer Menu (the mid-length, more foraged menu). I didn't want to post because they were working out their kinks, and I provided Iliana some suggestions. Whether she took my advice or not, some of the dishes are different from our meal. 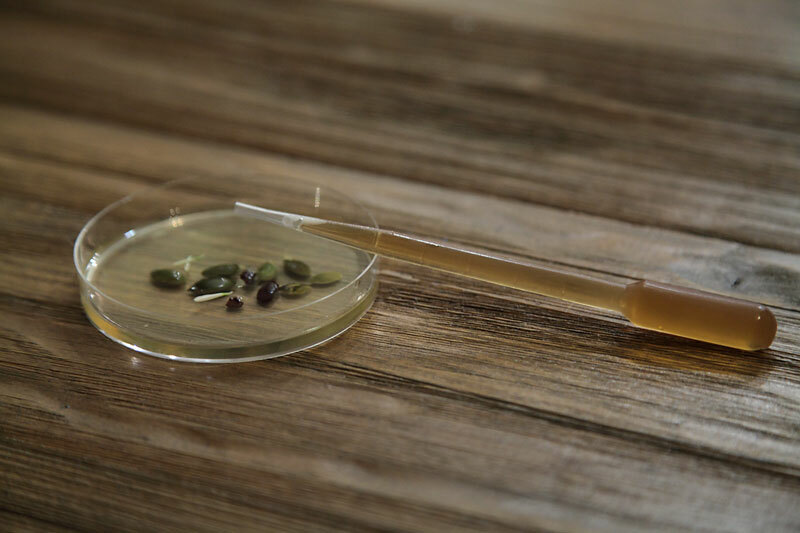 (The greatest problem was that the tea was not served sufficiently hot and so the capsule of herbs and cocoa nibs did not dissolve - but that is easily solvable). 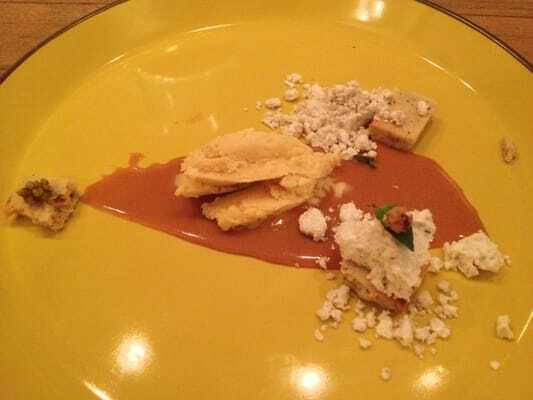 There was some problem in my opinion with the plating, but several of the dishes have changed. 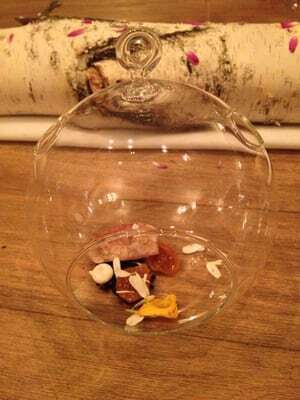 I particularly like the Huckleberry Pie Amuse, The Queen Anne's Lace Jelly, the Chanterelle compote, the edible soil and rose petals, the Duck, and the Sorghum. 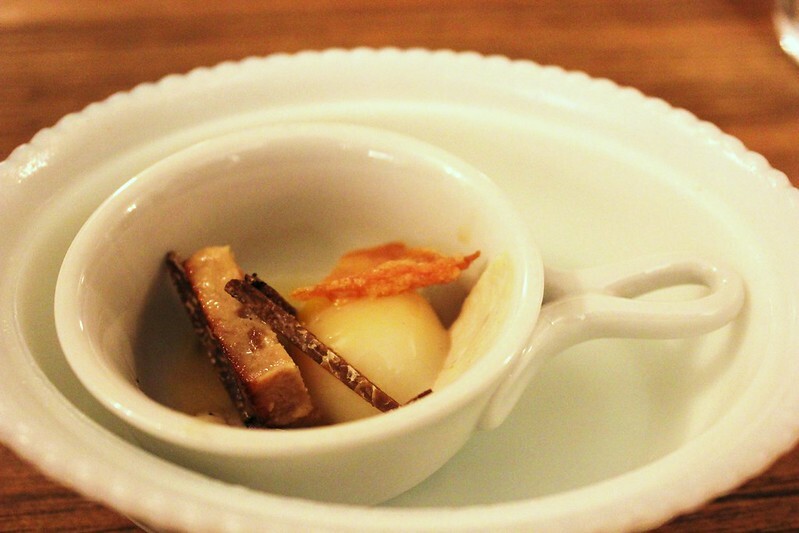 The Porcini caramel served at the end of the meal was absolutely delicious. The restaurant doesn't have quite the same aesthetic as Noma, the Copenhagen redoubt of all things gathered. 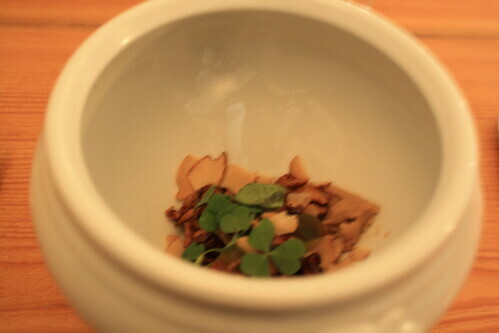 Noma is very spare and constrained dishes with a great emphasis on the herb (very light on proteins and carbs). Whereas the main protein at Noma was sweetbread with a little crab, perch, snails (and ants), Regan serves Bear, Deer, Salmon, and Duck: big proteins. Fewer herbs, but plenty of mushrooms. 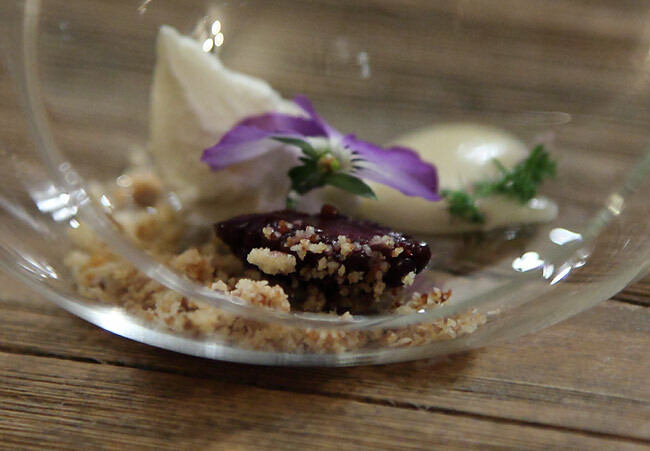 Elizabeth owes much more to the canons of modernist cuisine, linked to Alinea traditions (where Chef Regan had worked) and to El Ideas with which it shares a core aesthetic, but a different set of ingredients and a different sensibility. I am looking forward to seeing how Elizabeth develops. The photographer for the restaurant, Jen Moran, has a variety of photos from some of the menus on her page. 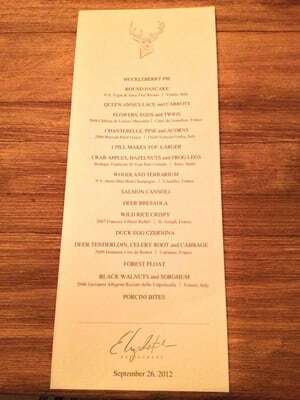 In the 11 days since I had the Diamond menu at Elizabeth, my feelings about it have continued to evolve in my mind. In spite of the communal, whimsical elements, it's also an intense, complex and emotionally resonating experience. 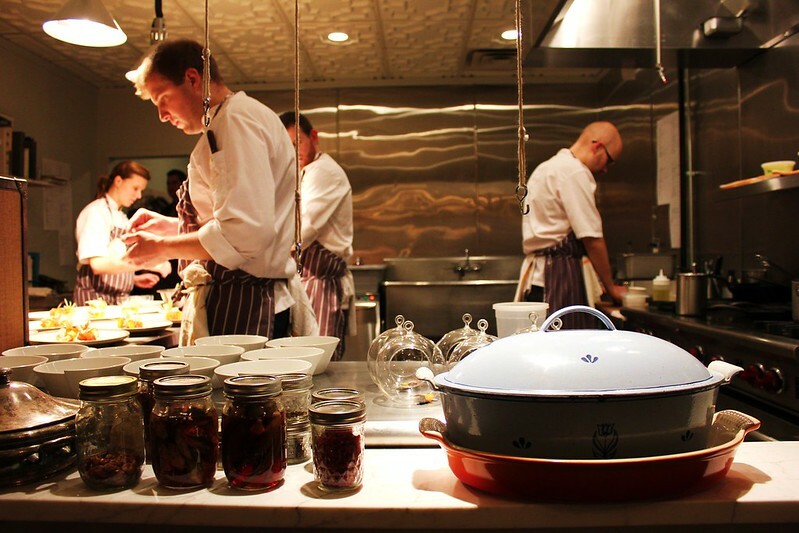 There's a depth and breadth to the food and service here that are truly distinguishing. The only meal I've ever previously had that I can even remotely say compared to this one was my lone dinner at One Sister, and that's for obvious reasons. Not only does the same Imagination power Elizabeth, but there were a few courses on our Diamond menu that were reprises from the meal at One Sister. My experience started with a humiliation of my own doing. I arrived 15 minutes late, while the other 7 people at my table -- 4 of them complete strangers to me -- waited for me to arrive. I hadn't counted on it taking 45 minutes to drive from Logan Square to Elizabeth but it being a Friday, I should have known better. When I finally arrived, I exited my car and noticed that it had been hit, though I'm not sure where or when. 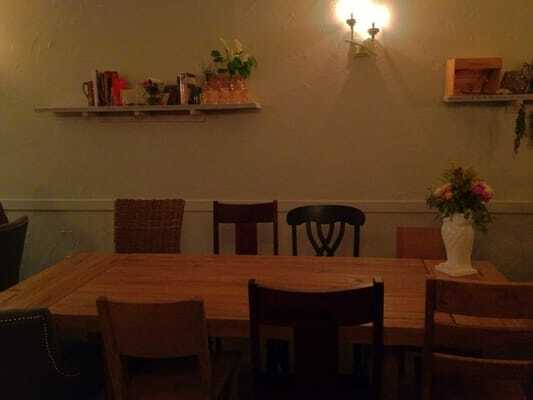 I rushed into the restaurant frazzled, embarrassed and apologizing to everyone in the place, even to people at other tables who were already enjoying their dinners. It was that kind of moment. Perhaps I recovered. I'm not really sure. Long after the 5-hour meal began I could never completely shake the memory of how I'd inconvenienced the other folks at my table. I also wondered how my late arrival affected the kitchen, our meals and those of the other diners. Paying in advance for your meal is only one small element of what makes eating at Elizabeth a genuine commitment. As a diner, you become part of a transcient community that lasts for one evening. The food was beautiful and meticulously prepared. Service, provided by local legend Scott Noorman, was fantastic. The roster of distinctive ingredients laid before us was of superior quality. We had 19 courses. I can't say I loved it all or even most of it. A handful were unequivocal joys to eat. Another handful were not to my liking. 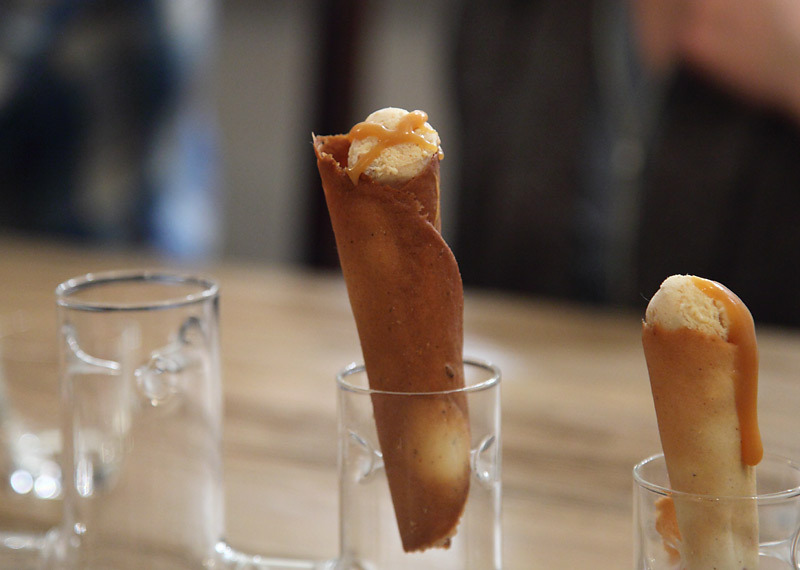 The remainder were interesting, provocative and memorable, though not necessarily what I would describe as delicious. I don't mean this as any knock on the food. This is some very specific cuisine and it's not going to appeal to every palate. There's nothing universal about it and that's a good thing, even though it didn't necessarily add up to pure dining joy for me personally. Unfortunately, one detail that really stands out is the price of this meal. It was one of the most expensive dinners I've ever had. All in, with pairings, tax, service charge (and tip on pairings) it cost $393 per person ($786 for my wife and I), which puts it right up there (and even over) with meals I've had at Michelin 3-star restaurants like Alinea, Alain Ducasse, Pierre Gagnaire, Mugaritz and Arzak. For some, spending that amount on this particular meal could be the greatest culinary value of their lifetime. Dining out is a hard activity on which to assess a hard value but on a relative basis, for me, it wasn't there with this meal. 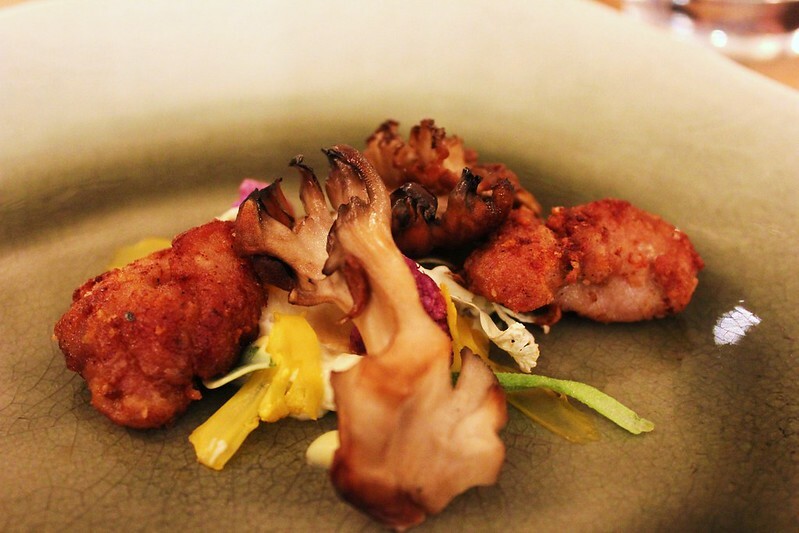 In spite of how distinctive the dining experience was and how dedicated chef is to her craft, I didn't feel that the experience matched the price tag. At the moment Elizabeth is a very interesting and promising restaurant but it's not world-class . . . yet. Here's a photo recap of our meal. 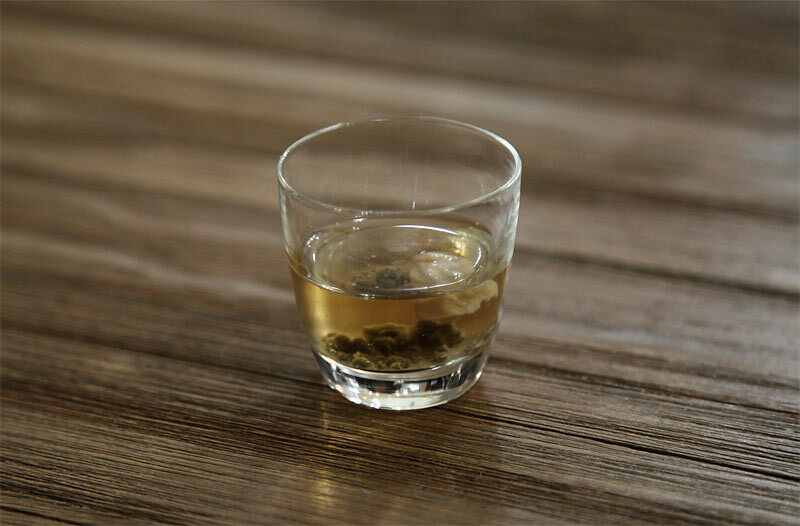 Descriptions are taken directly from the menu and pairings, which were thoughtful, largely successful and generously poured, are shown in italics below the course descriptions. I don't remember much about the details of each course, which were given to us verbally as the dishes were being served to us. 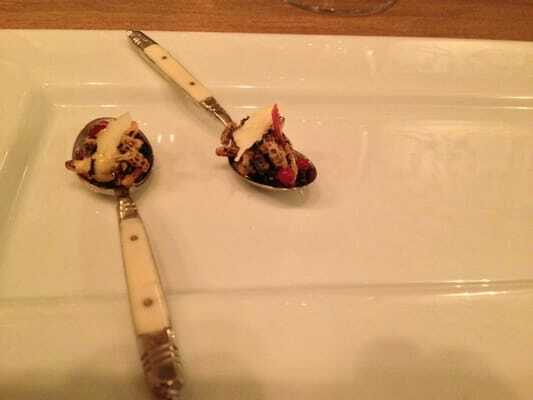 I enjoyed the crispy-tender texture and the goat cheese in this course. 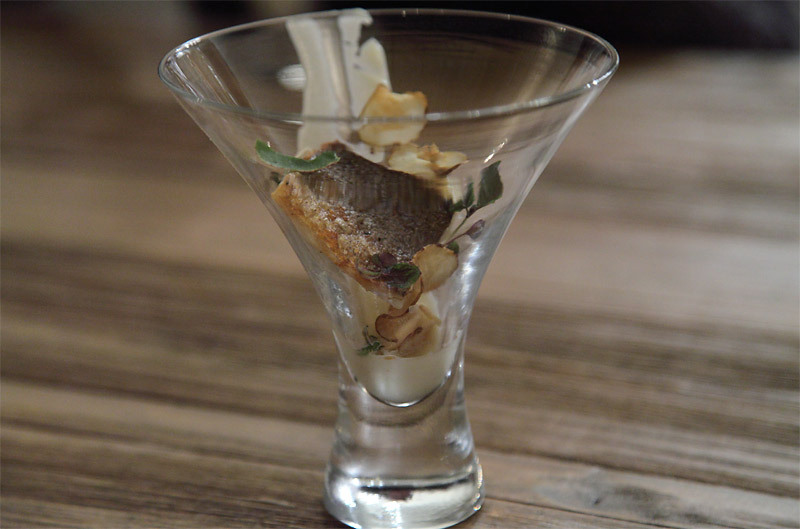 This course, with its crispy-skinned fish, was one of my favorites of the night. A very nice, super savory one-biter. I knocked mine over but managed to get a shot of my wife's. This course really didn't work for me. I think it was a duck liver sauce and I felt like it completely overwhelmed the perfectly cooked lobster. I really enjoyed this course, which was also a favorite of mine at One Sister. I thought the play on maki here was fun and the fish was terrific. That's deer heart and I wish there had been more of it. The funkiness of the aging on this beef was very apparent and I liked it but not as much as the slice of tender, unctuous tongue curled up next to it. A great course. You could probably rack up a tab like that, or close to that, at plenty of places once alcohol is involved. What I like best about the Elizabeth menu concept (I've yet to dine, but we did One Sister three wonderful times) is the true range of prices, which is something you cannot say for many of the places you brought up (I think). I'm as susceptible to sticker shock as anyone, and $393 per person is certainly steep, but it's got to be well within the range you expected, no? With the wine pairing option? A 5-hour, 19-course meal? Or would the high price have been OK had the meal better met expectations? It's been my experience that people care more about value i.e. "was it worth it" than price. I don't think the diamond menu was that expensive for what it is, but then again I ate it a few days after eating the kaiseki at Next Kyoto. It is very comparable. 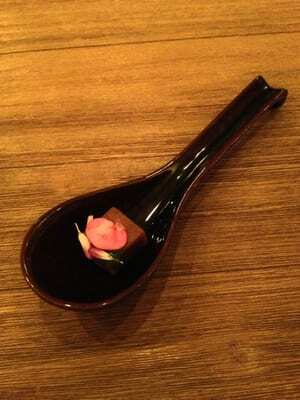 I would call it a Midwest-style kaiseki and it is priced about the same as the kaiseki menus served around Chicago. It is also a bit like some of the New Nordic restaurants I have been to, except a lot less alienating in the flavors and textures, which is a bonus to me. 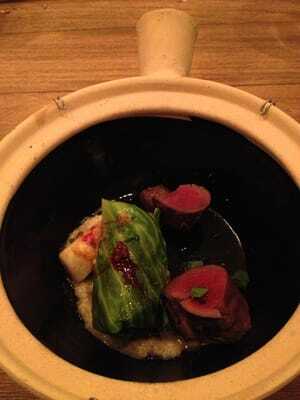 However, the deer menu also features many of her strongest dishes and is a bit cheaper. I feel it is probably the best value as it showcases her distinctive style much more than the owl menu does. 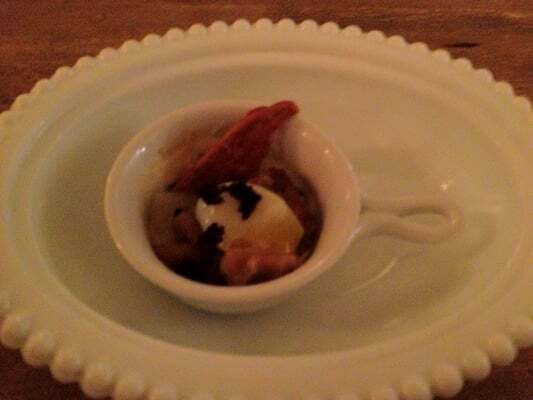 mgmcewen wrote: I don't think the diamond menu was that expensive for what it is, but then again I ate it a few days after eating the kaiseki at Next Kyoto. It is very comparable. 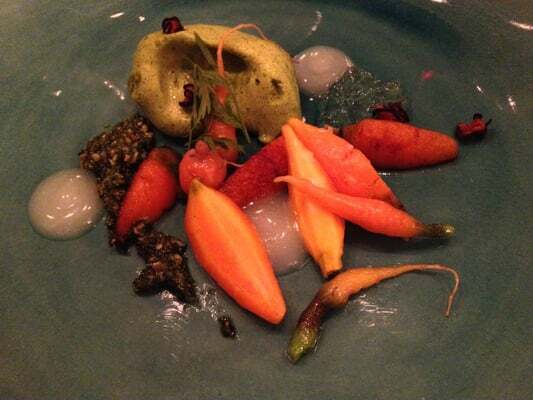 I would call it a Midwest-style kaiseki and it is priced about the same as the kaiseki menus served around Chicago. It is also a bit like some of the New Nordic restaurants I have been to, except a lot less alienating in the flavors and textures, which is a bonus to me. I ate (and paid for) the diamond menu. 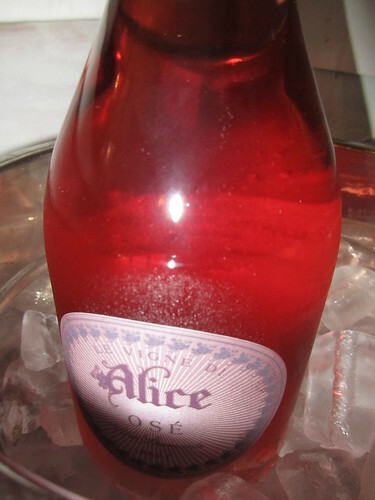 For $514 for two (sans alcohol), it was an extremely poor value. I did not find anything unique or interesting about the menu. There were 19 or so courses and only a couple were great. Knowing what I know, I just can't figure out why one would want to try the diamond menu rather than going to Alinea (If you're looking for a 20 course meal), El Ideas (if you're looking for a meal in a quaint restaurant overlooking a kitchen), or Tru (if you're looking for the best tasting fine dining food). Move Along, Nothing To See Here. 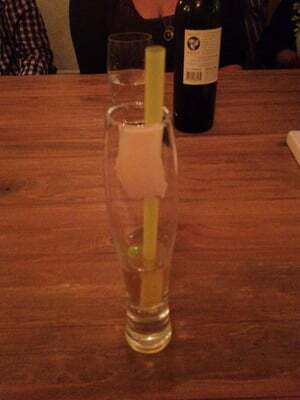 Vitesse98 wrote: You could probably rack up a tab like that, or close to that, at plenty of places once alcohol is involved. What I like best about the Elizabeth menu concept (I've yet to dine, but we did One Sister three wonderful times) is the true range of prices, which is something you cannot say for many of the places you brought up (I think). I'm as susceptible to sticker shock as anyone, and $393 per person is certainly steep, but it's got to be well within the range you expected, no? With the wine pairing option? A 5-hour, 19-course meal? Or would the high price have been OK had the meal better met expectations? To the best of my knowledge, the diamond menu is the most expensive meal you could have in Chicago except for Alinea and Spiaggia. 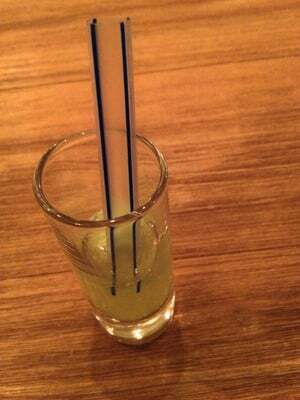 The alcohol was the cheap part of the meal. The meal did not live up to the expectation of the tab (which, as you state, was known when we sat down). I have had many meals where I spent this amount or more when I felt great afterward. Jazzfood wrote: It's been my experience that people care more about value i.e. "was it worth it" than price. It wasn't really the price that surprised me. After all, I bought tickets in advance. As for the places I mentioned above, some offer different pricing/meal options, some do not. 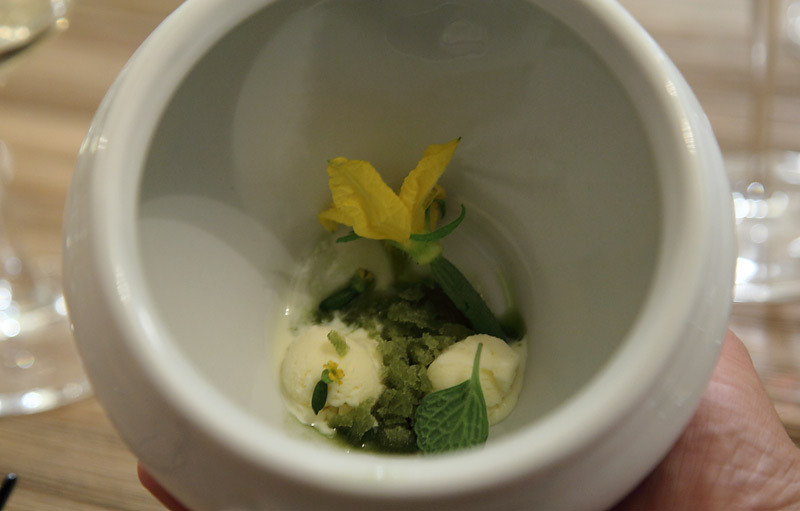 Alinea once did and no longer does, etc. Perhaps it was naive of me but I went into this assuming that by purchasing the most expensive menu, I'd get the very best of what Elizabeth had to offer. From comments I've heard and read about the Deer menu, maybe that's not true. In any case, it's not about the number of courses, the duration of the meal or the price. It's more intangible and emotional than that. I think my disappointment stems from what Jazzfood gets at. In the end, it just didn't feel worth it to me because the food didn't really speak to me. I wanted to love it and I didn't. I wanted to be wowed and I wasn't. When I think of the tremendous, life-changing satisfaction I experienced at the places I listed above, Elizabeth wasn't in the same ballpark. Don't get me wrong. I wouldn't have spent a good couple hours+ posting the pictures of my meal if there wasn't some part of the experience -- and the team behind it -- that I felt was truly laudible. But the experience was not compelling for me. It did not resonate the way other similarly-priced meals (or many less expensive ones) have. I think they're doing good work here. But if fine dining is one imagination communicating with another through the medium of food, Elizabeth and I just didn't connect as solidly as I hoped we would. To each his own I suppose. 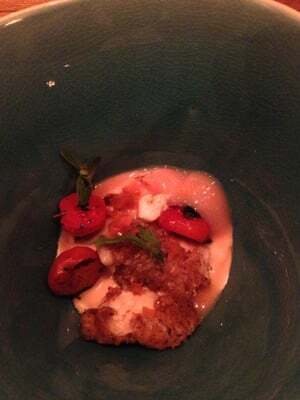 I did not enjoy my meal at Alinea this much. I did enjoy El Ideas, but I think Elizabeth is doing something really very unusual, intricate, and unexpected. I would be interested to hear more about what dishes you did and did not like and why. 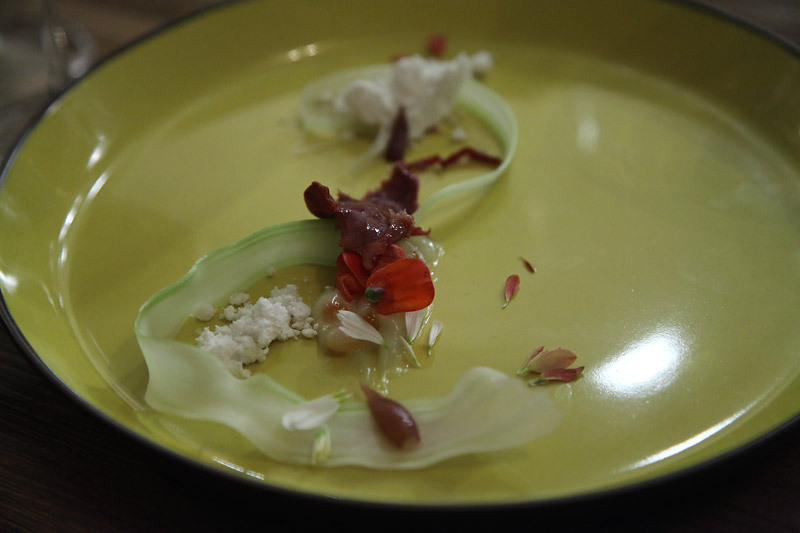 I think the Salad Sponge, Foraged Mushroom and Juniper, Apple Cider, Sunchoke and Loup de Mare, Shrimp Noodles, Oyster and Nasturtium, Hamachi and Fermented Leek, Heart, Celery and Pickled Onion, and Dry Aged Ribeye and Long Beans were all outstanding. However, interestingly I do think the deer menu features more outstanding dishes in general. However, while I am a fan of this restaurant and the chef, I would definitely prefer if there was one menu with all the outstanding dishes instead of them being scattered between several menus. I don't think the multiple menus thing allows the chef to give her all. Well, if you guys have underscored anything, it's that One Sister likely was the best dining deal in Chicago! I think Iliana's cooking, from preparation to personality, is distinctly different (from ingredients on down) from the fine dining establishments I've previously eaten at, almost all of which I'd consider prohibitively expensive and not "worth" the expenditure, though as isolated experiences I've still had some great times with good friends. Perhaps the key here is not value, per se - staying home is truly the best value in the city, or anywhere - but how well the experience sticks with you. Ronnie was very honest upfront about the stress and ordeal of even getting there; I know the feeling. I'd be curious whether his experience, and the value of the meal, would change for him under more conventional (which is to say, relaxed and casual) circumstances. God knows, the easy choice is just Nightwood, where I could eat every week. But knowing him (at least from the board) I have a hunch he'll be back and we'll all find out! 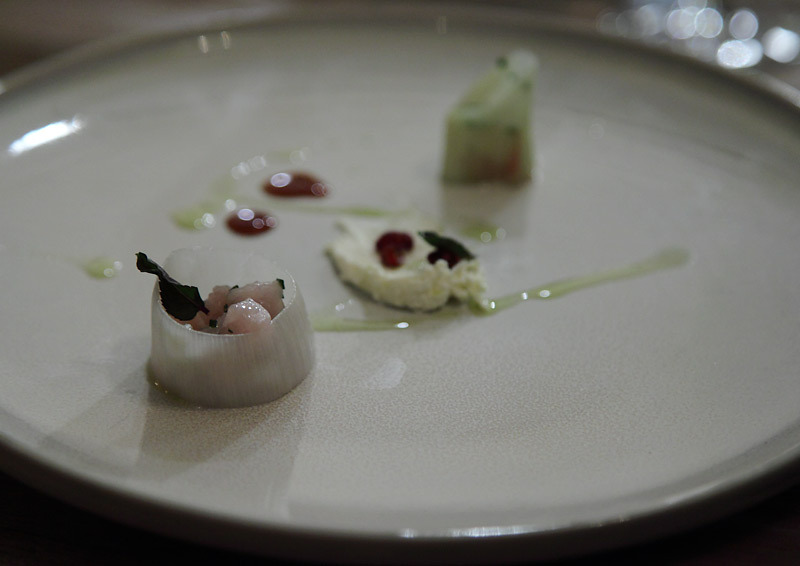 The place has had way too much hype, the Diamond menu is extremely expensive, and the dishes aren't anywhere as spectacular as what you'd get at Alinea, but even so, I thought it was worth it -- the whole menu seemed to me to be exceptionally well-conceived and prepared. 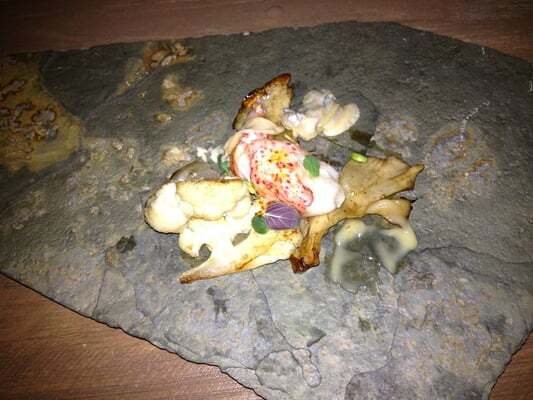 The lobster was about as perfectly cooked as any piece of shellfish I've had in my life. The hamachi and the ribeye were just as fine. The seasonings throughout were imaginative, but they're subtle rather than in-your-face bizarre, and that could be a letdown if you're expecting one of those meals beamed in from the starship Enterprise. 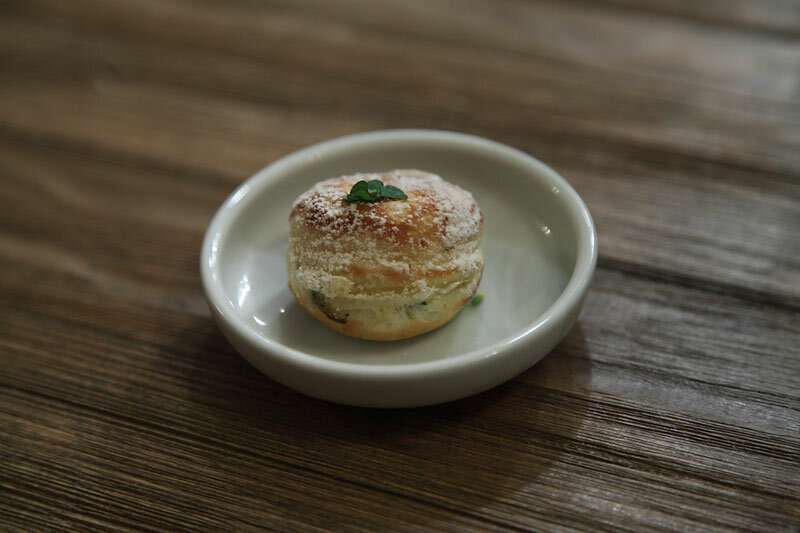 One of the tastiest dishes was simply a biscuit filled with goat cheese. I also appreciated that the dishes were very well balanced each other and that they were nicely sized; we left after 4 1/2 hrs feeling just a bit overfull rather than victims of some human foie-gras experiment. So don't go thinking you'll get the latest in cutting-edge molecular. The style is much more conservative than I'd expected, and I thought it was the stronger for it. Based on my experience with the Deer menu, I think that Iliana's ultimate challenge is to create a distinctive style of cuisine that matches her distinctive ingredients. The reason that Elizabeth is often compared to El Ideas is that both Foss and Regan work within the broad Modernist style of cuisine (Molecular cuisine, after it settled down into a canon of recognized techniques). In this sense Elizabeth feels different than Noma. Obviously this is an unfair comparison: a casual, informal restaurant with the world's number one restaurant (and even the comparison is a compliment - as are the comparisons with Alinea: just consider the size of the staff alone). 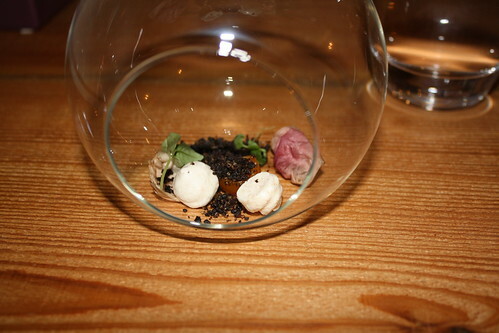 However, there is a distinctive aesthetic on the plates at Noma, not just the ingredients. I don't mean that Elizabeth is producing the same dishes as are served at any other restaurant (and at the Friends and Family dinner some of the dishes were splendid and some needed tweaking), but the style of dishes will be recognizable to those who have dined at the leading modernist restaurants. 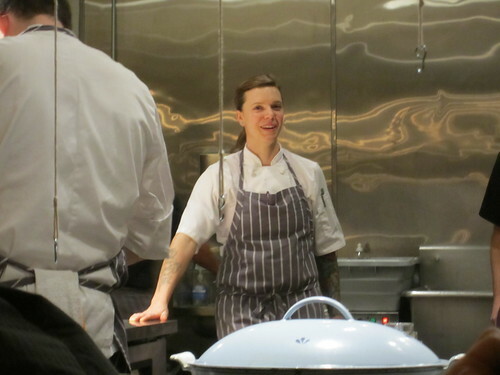 All this is to say that Elizabeth is doing something special right now, providing Chicago's only Gatherer's Cuisine, but the question is how will the restaurant will develop in the months and the years to come. 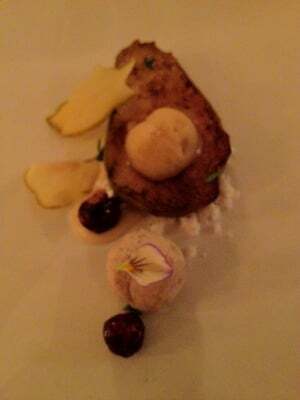 GAF wrote: The reason that Elizabeth is often compared to El Ideas is that both Foss and Regan work within the broad Modernist style of cuisine (Molecular cuisine, after it settled down into a canon of recognized techniques). In this sense Elizabeth feels different than Noma. Obviously this is an unfair comparison: a casual, informal restaurant with the world's number one restaurant (and even the comparison is a compliment - as are the comparisons with Alinea: just consider the size of the staff alone). . In terms of New Nordic, Iliana reminds me much more of the less well-known Frantzén/Lindeberg in Stockholm, which also has a fairly small staff and kitchen. 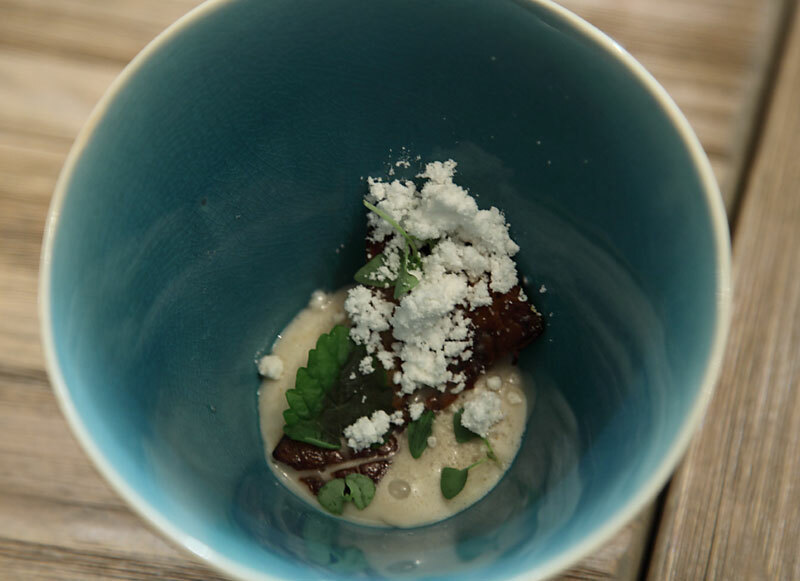 The concepts I experienced in her One Sister dinners were very similar, with each dish almost being like a tiny landscape that evokes the local woods, rivers, and farmlands. I think you've hit the nail on the head. Too much going on. 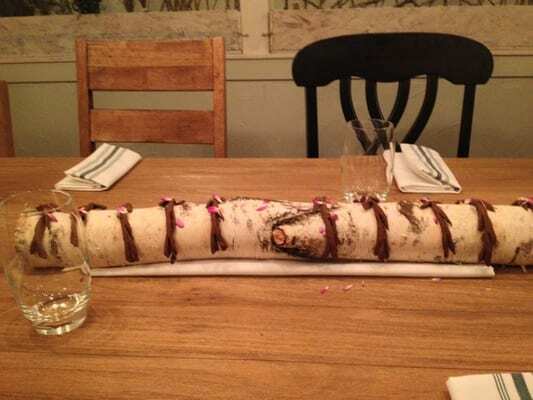 There's a reason the best high-end restaurants have limited menus/options. Yes, I also feel that the three menus concept prevents her from doing what she did at One Sister. The evocation of local farmlands is int he Owl menu, the woodlands in the deer menu, and the diamond menu feels a little lost at times concept-wise. A tighter menu that is more focused on her strengths would be much better and I think it's possible the three menus will ding the restaurant come Michelin inspector time. but maybe I'm wrong. Still a little jet-lagged, I felt I was operating at about two-thirds capacity last night, which gave my experience at Elizabeth an appropriately dream-like quality. I pretty enjoyed most dishes, some more than others (I didn’t quite get the corn bread and trout row, too bready, and the lamb, though good, seemed too easy, somehow). 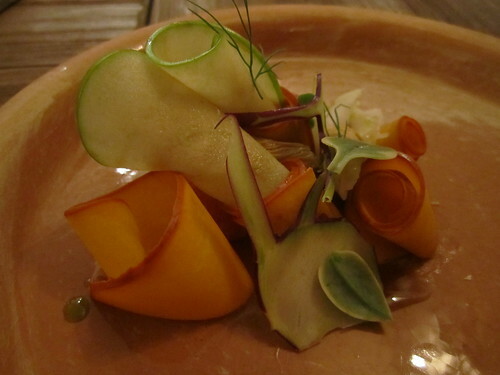 The dish I will remember most, though, was the Pumpkin, Apple and Gravlax. Pumpkin and I have a troubled relationship, so for me to pick this pumpkin-focused plate out of all the rest is really saying a lot (at least for me). 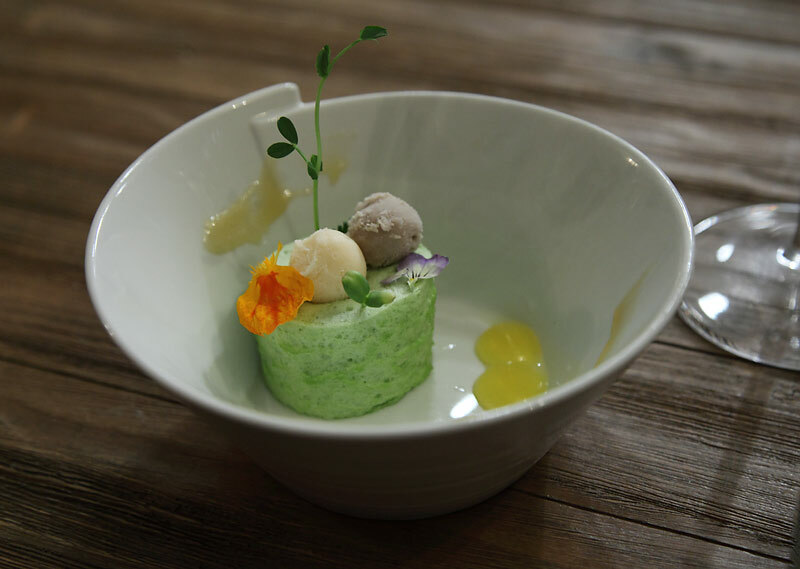 At the risk of sounding too precious, what I dug most about this dish – aside from the freshness of the ingredients and the surprisingly edible deliciousness of the candy pumpkin – was the sculptural quality. It was just beautiful to look at and pull apart and eat. I also greatly appreciated the fanciful presentation of gently-mediated ingredients, at least one of which (crystal lettuce) I’d never had before (note: Carolyn did not have any in her salad, which might be a troublesome inconsistency, but I remember a line from Longinus on aesthetic carelessness, something to the effect of: You want a clean and tidy work of art, hire a damn janitor). When I arrived, I took a seat so I could observe the kitchen, and I was not disappointed with the view. I liked watching chef Regan, the way she moved around the kitchen, working with her crew. I took a bunch of stealth shots, and sometimes she caught me in the act. 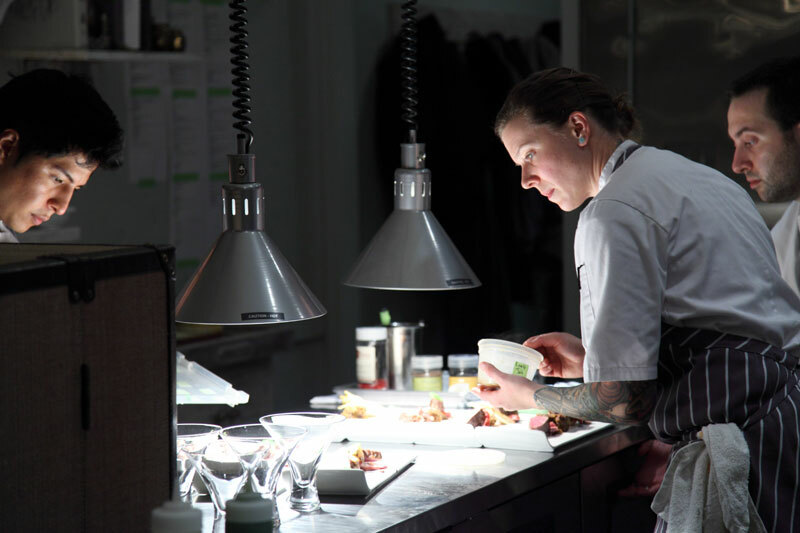 Regan has that kind of calm center that I’ve seen in the few chefs I’d feel comfortable calling “artists” – Achatz, Mendez, a few others – a kind of vision for what they want, a meditative sensibility and commitment to themselves that I don’t think you can fake. I’m glad GAF and BR brought their Canon Rebels. I left mine at home, but it struck me as unusual that we all had the same kind of camera (isn’t it time we offered Canon the chance to sponsor LTH?). Supremely cool of Regan to serve up some raccoon – and much thanks to GAF for organizing. I too was at the Thursday dinner GAF organized, and I'll admit I went in with lightened expectations. Perhaps that was because of some mixed reviews here, or perhaps the fact that I worry that some diners get carried away with new and lesser known ("underground" perhaps) restaurants that offer creative, modern techniques and clever plating. I was also concerned that dinner would be mostly focused on foraging, and less focused on the food. But I came away from Elizabeth smiling broadly, thinking that I dined at a restaurant that has the chance to achieve greatness, even if not quite there yet. So no, not everything wowed me. 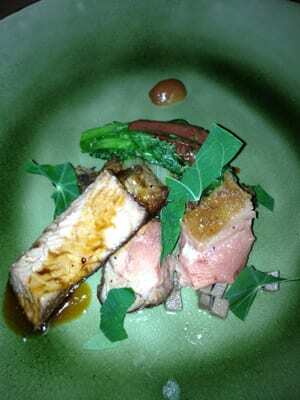 But some dishes truly stunned, at a level well above what most restaurants are doing. With further seasoning, I'm convinced Elizabeth will shine even brighter. In terms of atmosphere, they've gone a slightly different route than El Ideas. Despite the completely open space, the room is a little calmer. The chefs work rather quietly, the music is for the most part in the background and not very noticeable (okay, except the very brief intro to White Rabbit, before I thought I heard the needle pulled off the vinyl), and there's a bit of an elevated service experience, particularly given the thoughtful cocktail and wine service. That's by no means a knock on El Ideas - they're just different. There has also been tremendous consideration given to the overall dining experience - the room is nicely, though not expensively, decorated. 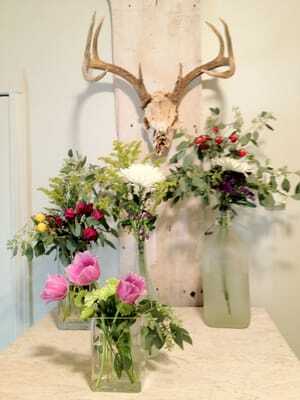 Wood tables and mismatched chairs perhaps serve as a reminder of a farm, or foraging, element. And the array of beautiful serving pieces remind you that no details are ignored, that Elizabeth aims higher than most, and that they aim to touch every sense. 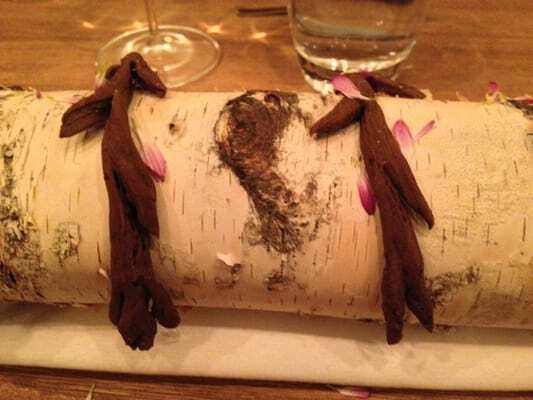 We ordered the owl menu (8-10 courses), although we were served 14 courses, including raccoon as discussed generally in the events thread post. 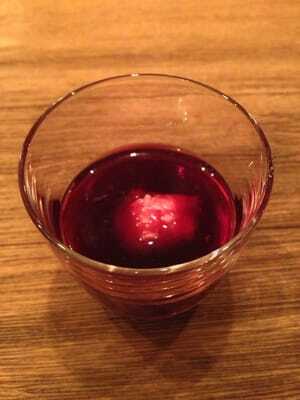 I started with a terrific Old Fashioned, then moved on to wine pairings, which we shared (essentially, a half pour). Overall, I thought the wine pairings were excellent and clever. My only thought is that on my next visit, I would prefer to have full wine pairings, but I knew I had an early and busy morning at work the next day and didn't want to drink too much. 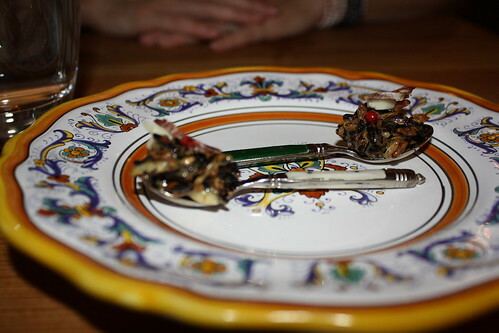 Our first course was called Apple Pie and American Caviar, an amuse of sorts. 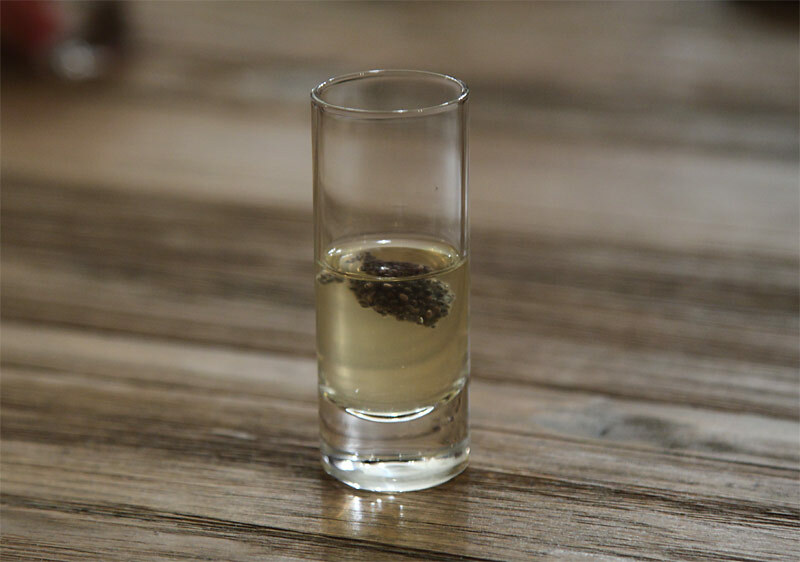 There was apple, spices and caviar. I did not quite find this course to be the best introduction for Elizabeth. I thought it was a little too sweet, and the caviar was slightly lost in that sweetness. 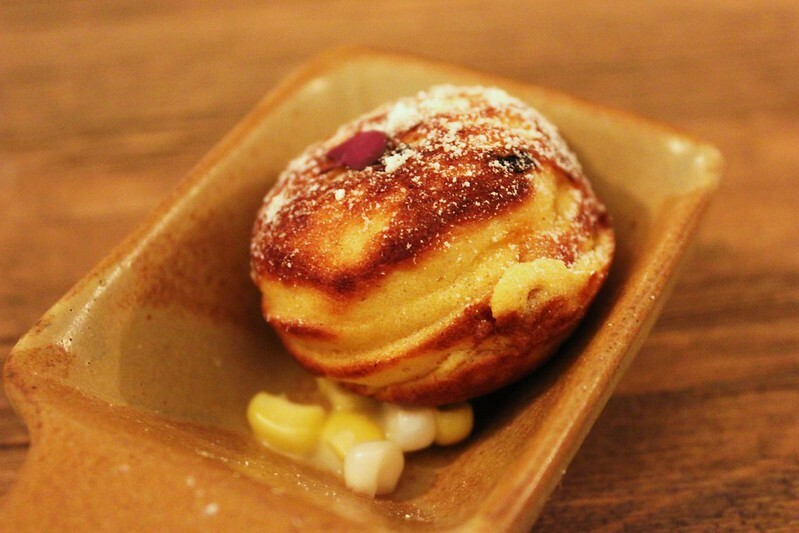 We moved on to the Trough of Tastes - a buttermilk biscuit, whipped bacon fat, a beet marshmallow and perhaps a fruit preserve of some sort that I cannot recall. It was suggested that we drag the biscuit through the bacon fat, though I first wanted to taste the biscuit, which proved to be delicious and light and flaky. The bacon fat was a great complement and truly tasted of pure bacon. 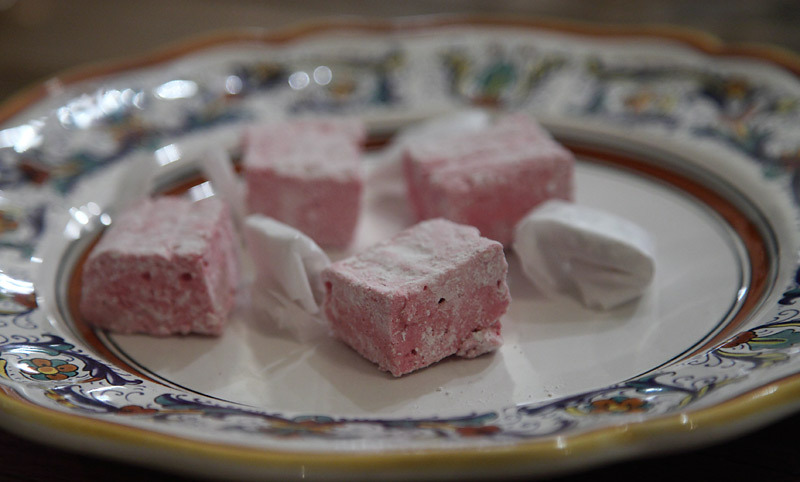 And the beet marshmallow had the perfect texture, although I cannot say that the beet flavor shined through. Overall, there were some nice flavors here but I don't know that it all came together. 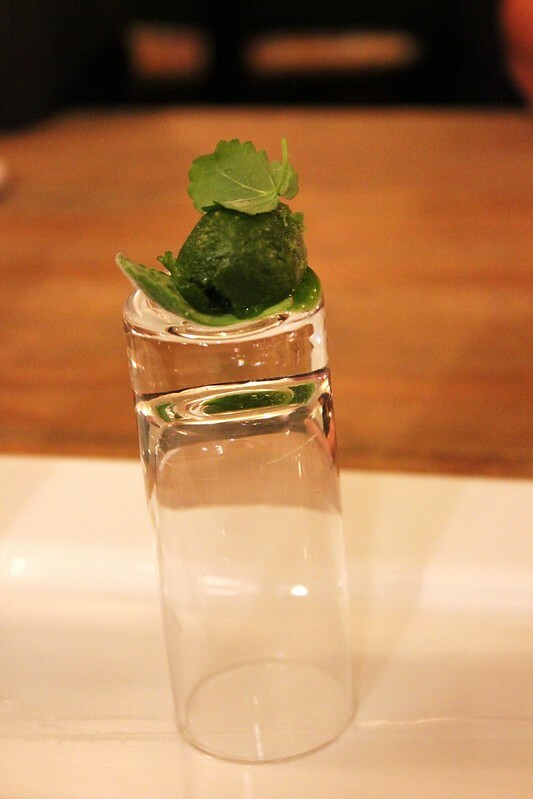 And in terms of progression, I wonder whether this would not have fit better later in the meal, as we neared dessert. Carrot Tea and Ginger was next, and though flavorful, I mostly remember tasting the ginger. I might have loved this dish had it delivered more carrot and a little less ginger. Though I love ginger, I wanted a little more balance. 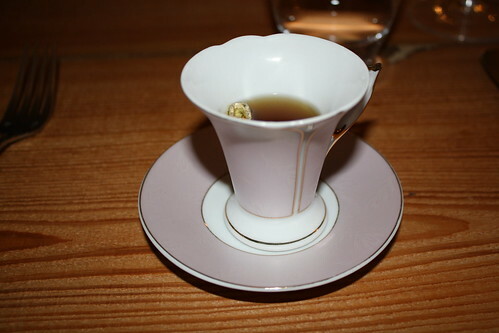 One theme throughout dinner was the beautiful service ware, and this tea cup (shown below) was just one example. 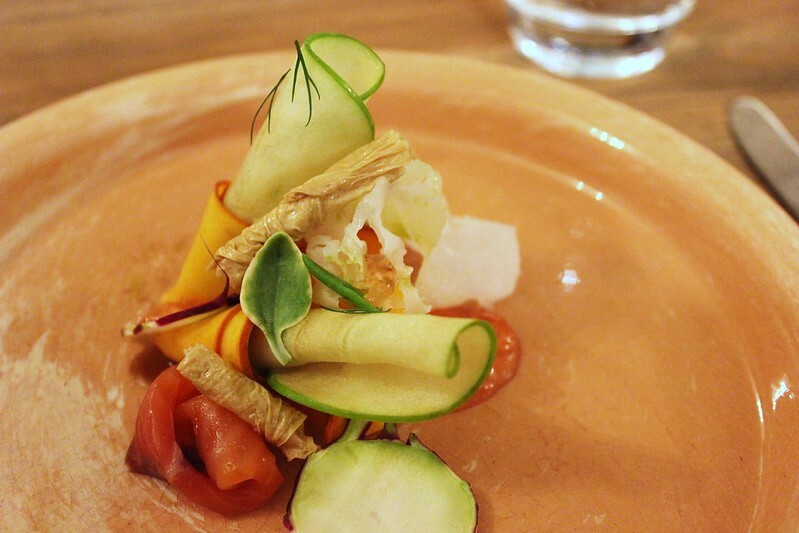 Our fourth course - Pumpkin, Apple and Gravlax - perhaps provoked the most discussion, as pumpkin is not so universally loved. And then there was the leaf of crystal lettuce, something I had never heard of. And finally, the debate about the worthiness of the dried bean curd. There were elements of this dish I really enjoyed (mostly, the gravlax). But this dish just did not come together for me. I struggled to understand how to eat it and how it all fit together. And I really didn't like the dried bean curd, which was not so dry that it merely crumbled or broke; rather, it bent. I felt like I was eating a twig. 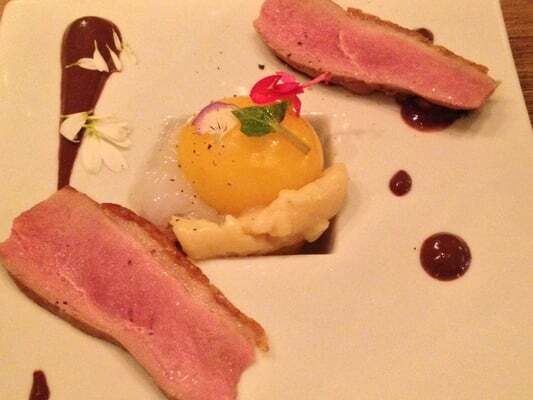 The sum of parts was beautifully plated, but the overall dish just did not work for me. After four courses, I was beginning to have some doubts. I was truly enjoying the company and the atmosphere, but nothing had wowed me. As if I was a character in a dramatic movie, my thoughts were stopped in their tracks. We were then served one of the best soups I've ever tasted, Celery Root Soup, and it was from this point on that the meal largely wowed me. The soup was so smooth and creamy, yet intense with celery root. 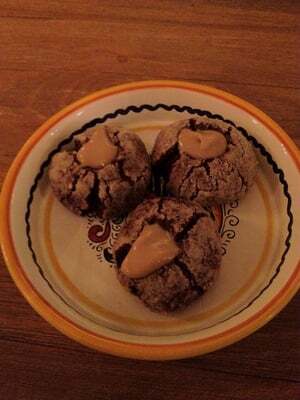 Black walnuts delivered a nutty, sweet addition. And there was a freshness from radish. There was more than just celery root going on here, and it was all sensational (and I even think I'm ignoring an element or two of the soup). 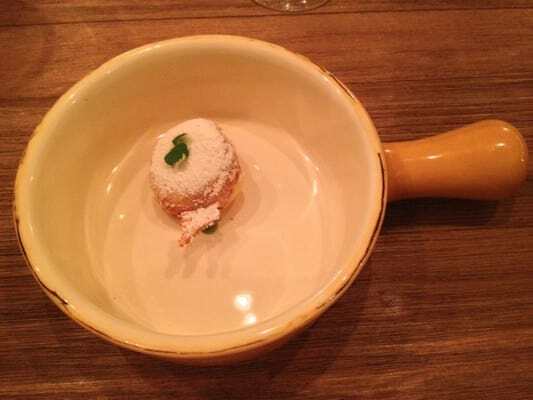 The Cornbread and Trout Roe that followed stood only a small chance of success in light of the excellence of the soup, though it showed some promise. There was also some maple syrup and fruit I think. Where this small and beautiful bite fell short though was the cornbread, which was just a little too dry. Had they slightly undercooked the cornbread and left it a little soupy, this might have been terrific (maybe a tad more roe too). I enjoyed the combination of flavors, and I found the salty-sweet bite to pair well in between two very rich, savory courses. Cauliflower, Sweetbreads and Fresh Cheese. 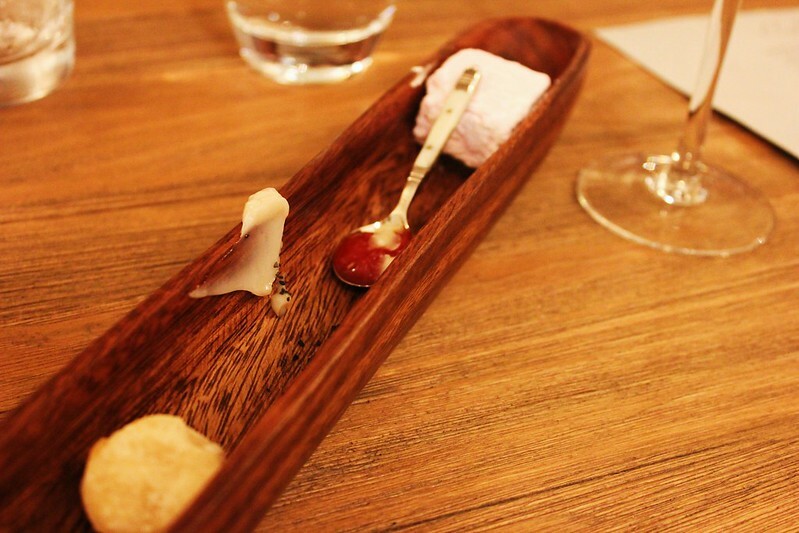 The cheese was a housemade mascarpone, which I recall having a slight lemony taste. I thought it was all cooked perfectly and there were some terrific flavors, but this course was a little dry for me, even with the mascarpone. I think some kind of reduction would have elevated this course from good to outstanding - it was so close. Elizabeth's Homemade Bread and Charcuterie is akin to calling the Baha'i Temple merely a house of worship. 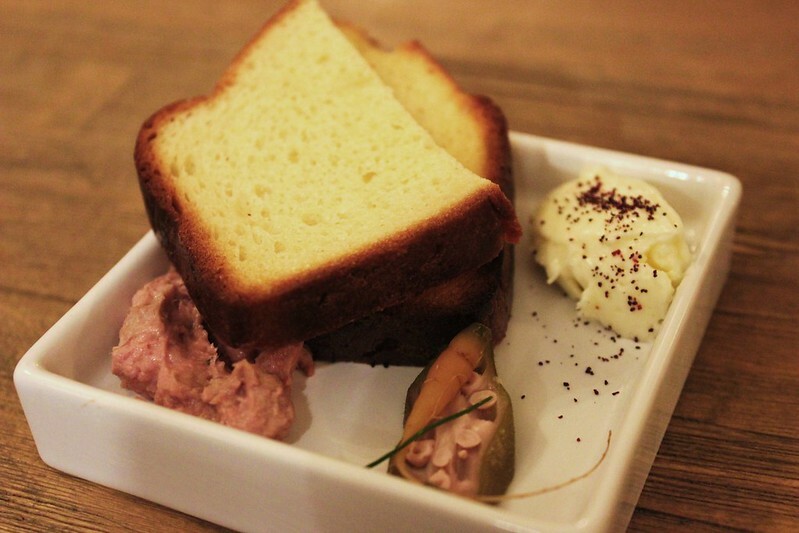 Luscious duck rillettes, toasted housemade brioche, pickled carrot and okra, and house-churned butter with beet powder. Every single component of this dish was outstanding, the lightly pickled vegetables cut nicely into the richness of the dish, and shame to anyone who leaves a speck of the rillettes or butter on the plate. 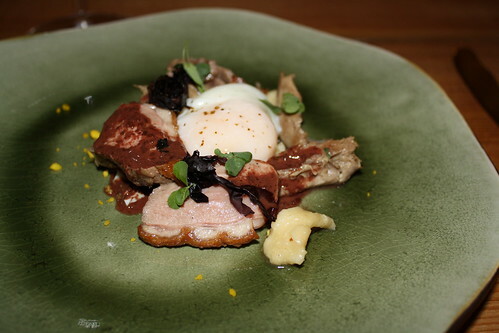 I cannot recall all of the components of Hen and Egg - I know there was chicken and chicken skin, a beautifully poached (or sous vide-cooked) egg dripping yolk, black truffle I think. 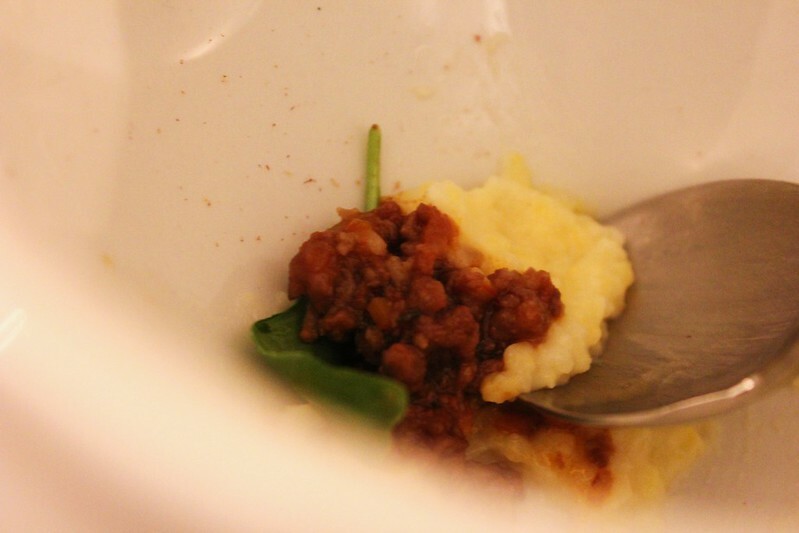 But it was all rich, perfectly cooked and just delicious, not to mention thoughtful in its contrasting textures. 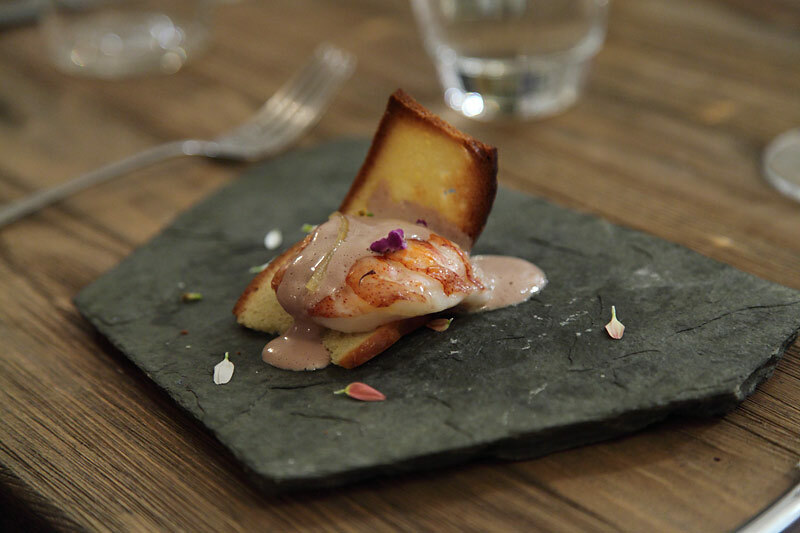 The flavors were all so familiar, but the perfect execution and presentation really elevated the dish. A gift to LTH, we were then served Raccoon Bolognese. Clever. I had never tasted raccoon. In your typical Bolognese, there may be veal, beef and pork. The raccoon might have lent a similarly complex flavor, though served like this I can only be certain it was not your average white meat. 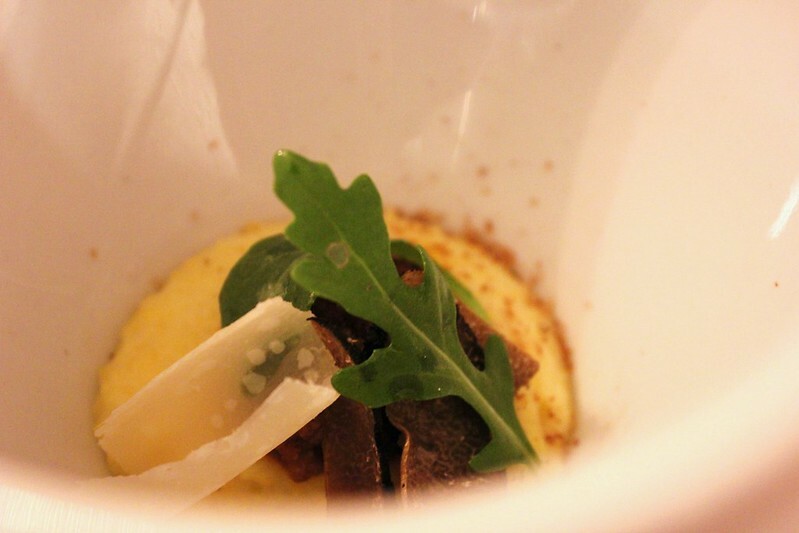 But this rich Bolognese, paired with a delicious creamy polenta, parmesan (and black truffle again, I think) was excellent. It could rival the outstanding Bolognese I've learned to adore at Merlot on Maple. 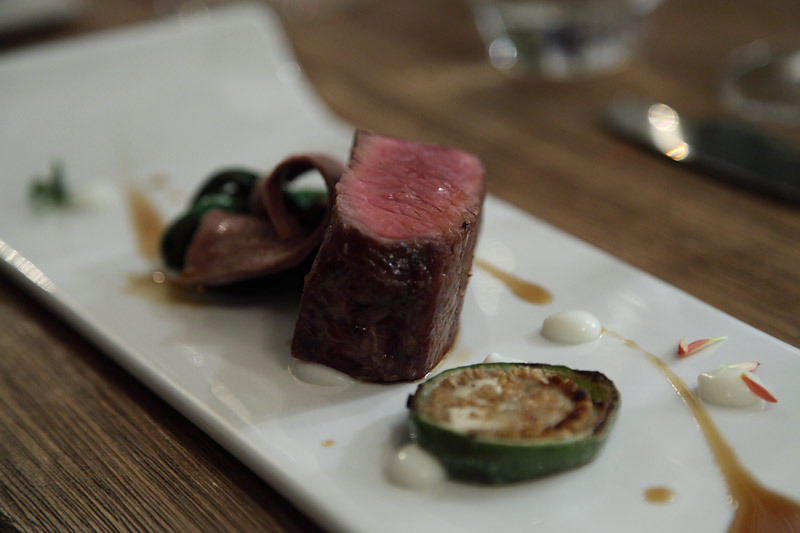 The talent and array of skills in the kitchen continued to shine with our next course, Lamb and Fall Fixings. This might have been my favorite course. But interestingly, as I read David's comments, I'm reminded how personal food and food tastes can be. 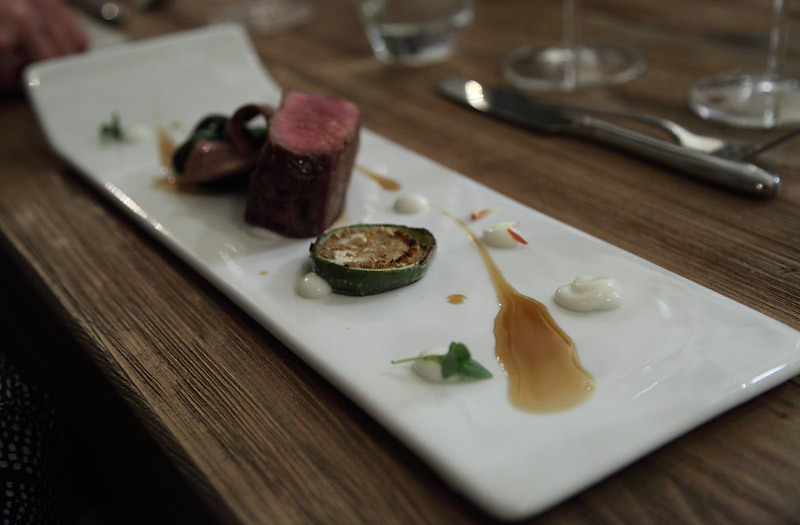 I was tantalized by the picturesque lamb, cooked sous vide and then seared, and deliciously tender. 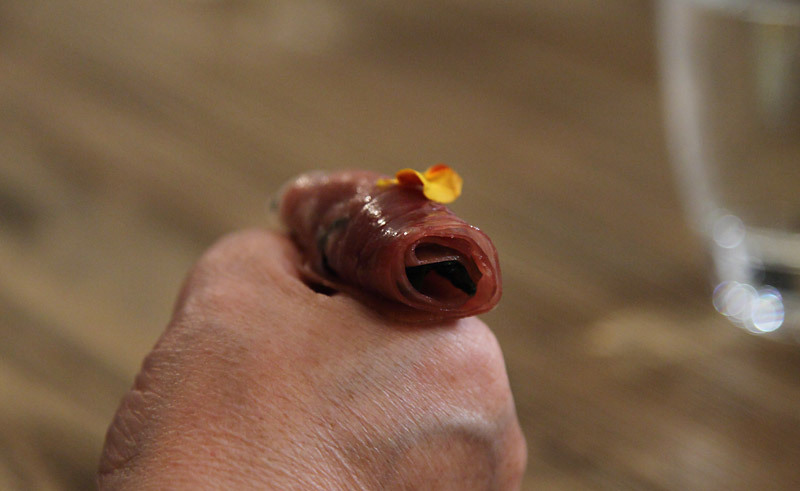 I was wowed by the addition of a lamb's blood sauce and lamb tongue. Then paired with root beer leaf, pumpernickel and cipollini onions, I was left almost speechless. So many familiar tastes, but also the less familiar (lamb's tongue and blood and root beer leaf). 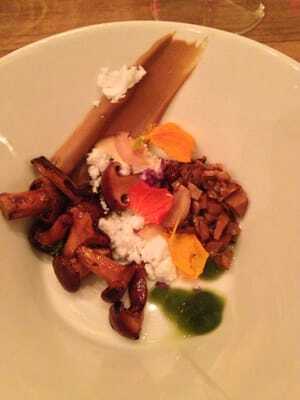 And fall fixings indeed - this dish sang fall in all respects. The meal was now winding down, and we were taken slightly off course with what would appear to be a palate cleanser, Swiss Chard and Smoke Aroma. 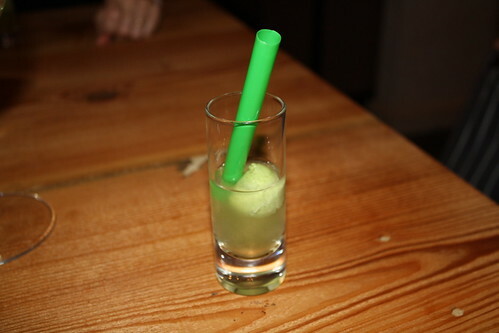 The swiss chard sorbet, served atop an upside-down glass, had a great, smooth texture and was delicious. 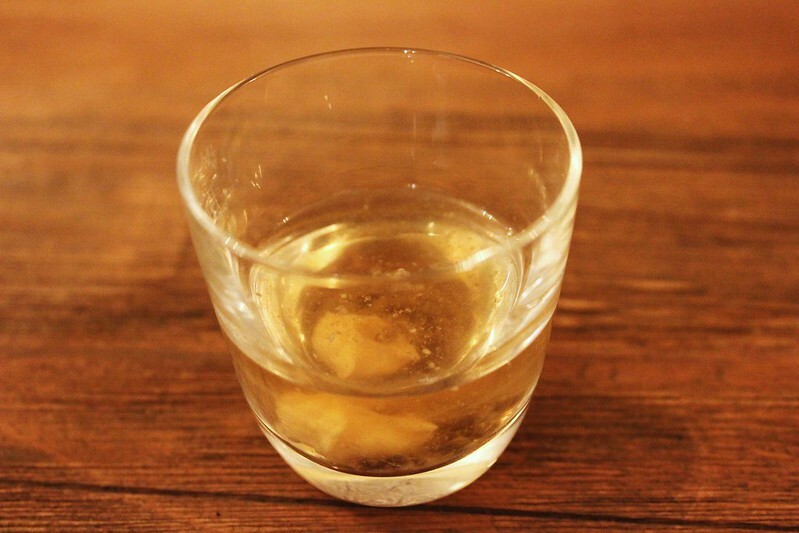 Then turn the glass over to inhale the trapped apple-wood smoke. This was unique, but I also thought the residual smoke cleverly played into the next course. Our principal dessert was Pears and Hazelnuts, but of course there was more going on here - bacon too I think. In any event, I thought it was delicious, nutty and not too sweet. The smoke from the previous course lingered and elevated the dessert. 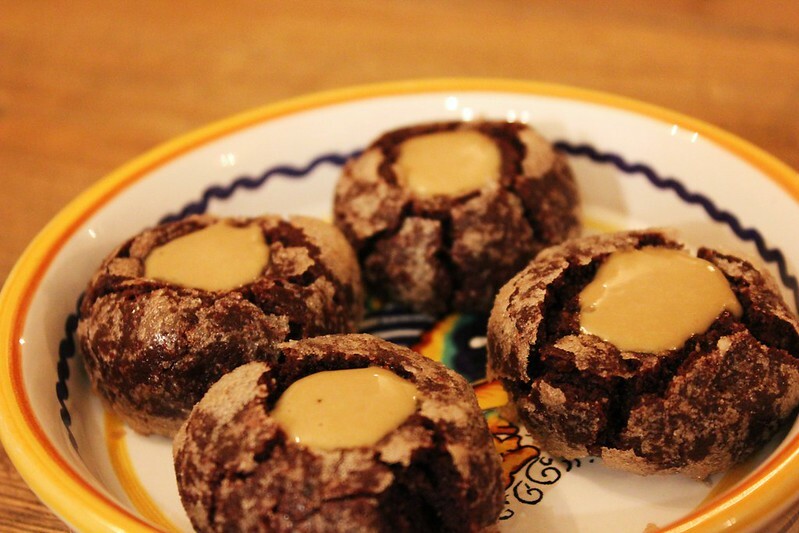 Finally, Bites - dark chocolate cookies, rolled in almonds, pressed and filled with what I think was Earl Grey-caramel. A very nice finish. 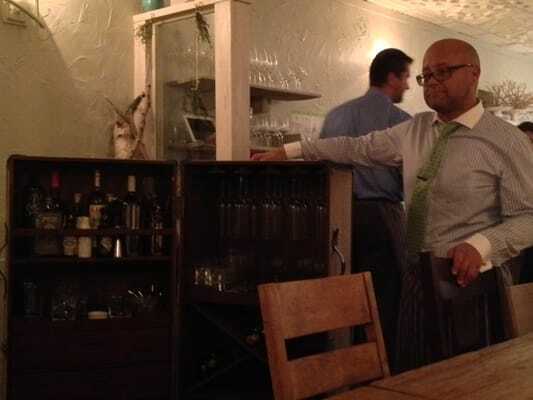 I thoroughly enjoyed the company and conversation, and I realize that played heavily into my enjoyment of the evening, but I also believe Elizabeth is a very special restaurant, even though they may still be feeling their way in their early days. I thought five of the fourteen dishes were outstanding - the celery root soup, the brioche/rillettes, Hen and Egg, Raccoon and Lamb. A couple of other dishes I thoroughly enjoyed. 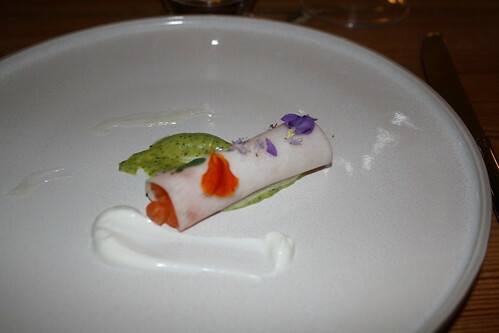 There were also several thought-provoking dishes - in terms of presentation, preparation and ingredients. And service - including knowledge of the courses and wines - was also excellent, worthy of a special night out. Since this was my first experience with Elizabeth and because I never dined at One Sister, I can't offer thoughts on how the various menus compare, and I can't recommend one over another. But I think Elizabeth is a special restaurant and you'd be wrong to ignore it. 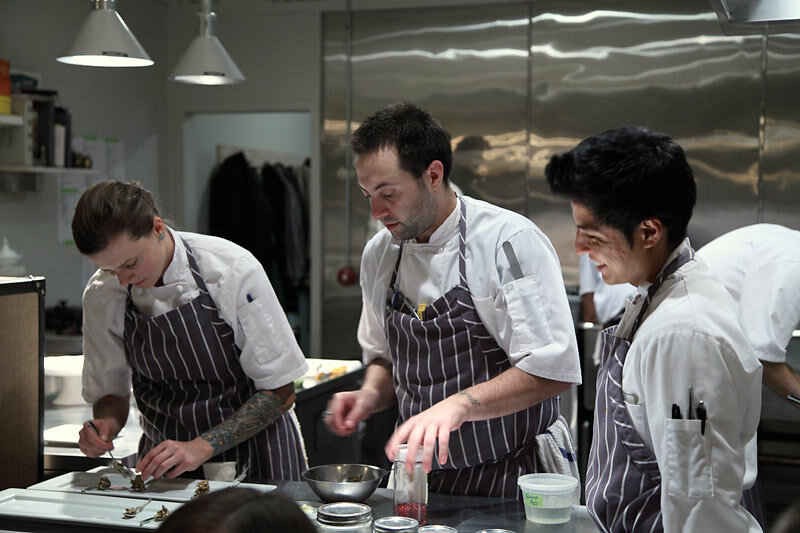 There is obviously a lot of talent in the kitchen, and I look forwarding to watching it grow. Big doings are happening in Lincoln Square, perhaps once unthinkable (in terms of price point), with Goosefoot and Elizabeth. In addition to my favorite Thai restaurants and my new favorite neighbor Monti's (Philly Cheesesteaks! ), I'm very pleased to call them neighbors. And I can't wait until my next visit to Elizabeth - it will be soon. Last edited by BR on February 7th, 2013, 7:35 pm, edited 3 times in total.